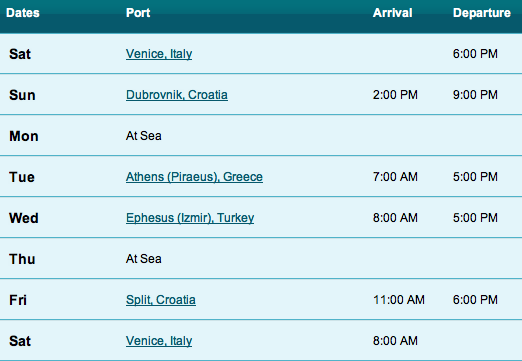 We planned this big vacation, and said this was our birthday presents to ourselves. 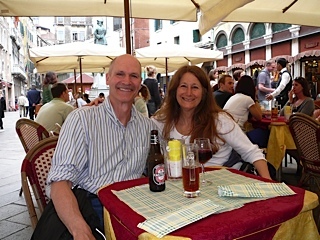 Lynn had the much more momentous birthday, going into the next decade, and giving me a reason to make this trip more momentous, going to new locations for us with Venice being the only place we visited previously. 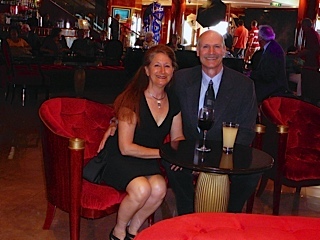 Cruise prices were reasonable at $100 per day (inside), per person and we got one leg for slightly less by watching for price drops. 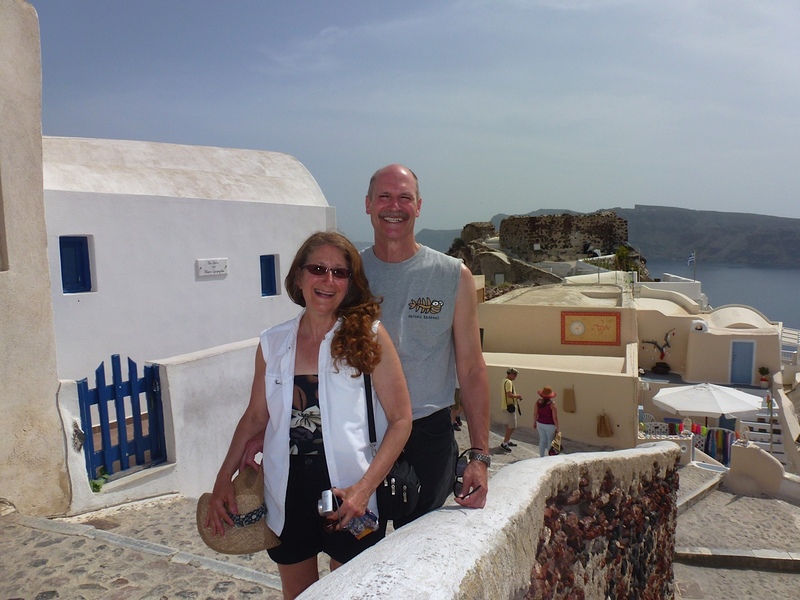 Airfare was hard to know when to buy and what was a good price. 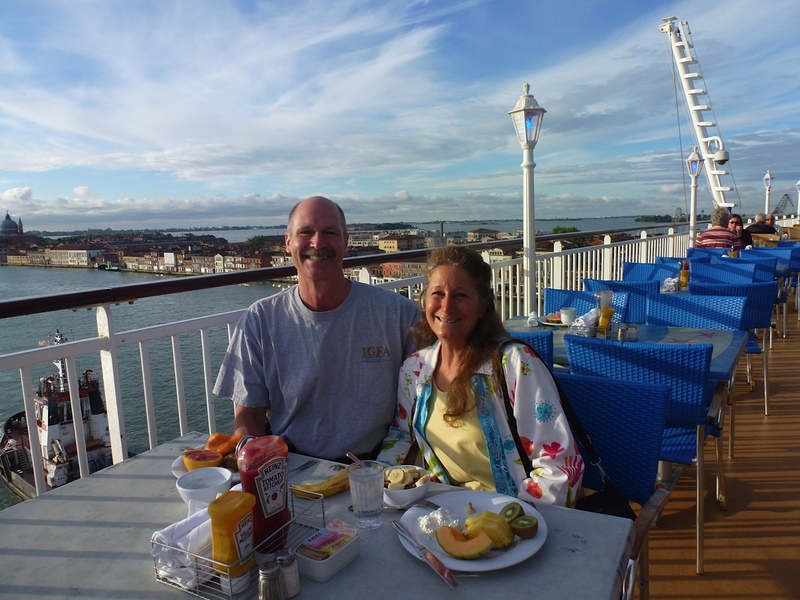 We locked in at $1,235 per person in August, yes nine months in advance, and used our sky miles to knock off $500 and $300. 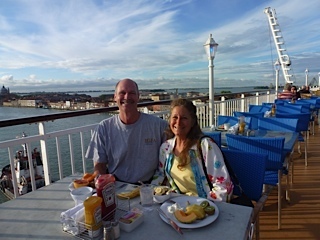 Then Lynn bought airfare insurance for around $100 for both of us, not knowing everyones health, etc. 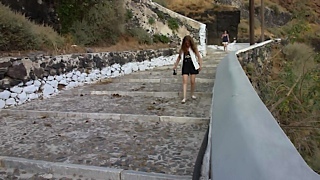 that far in advance. 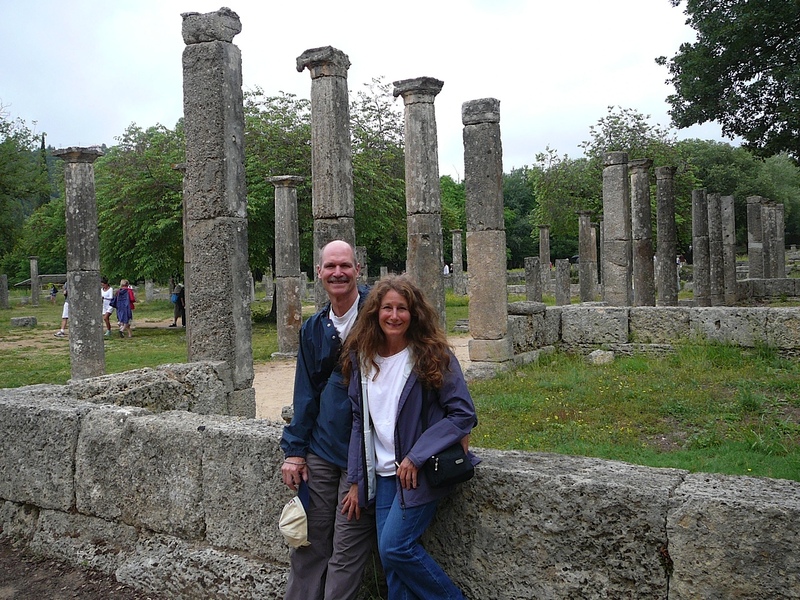 In hind sight the airfare price seemed good as we did not see a big price drop. 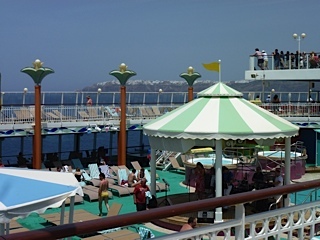 We only put $250 deposits on the cruises, with one of the deposits being a certificate we bought last year on Norwegian. 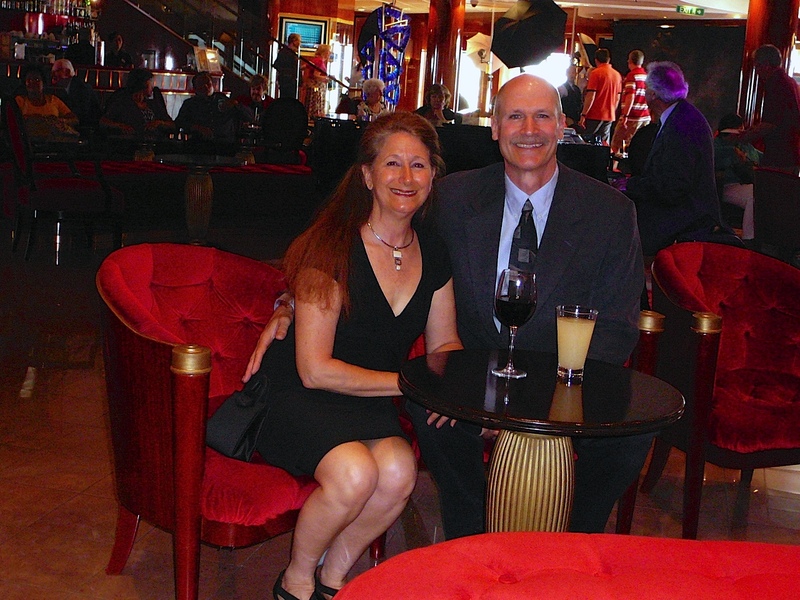 We didn't have to make the final cruise payment and financial commitment until February. 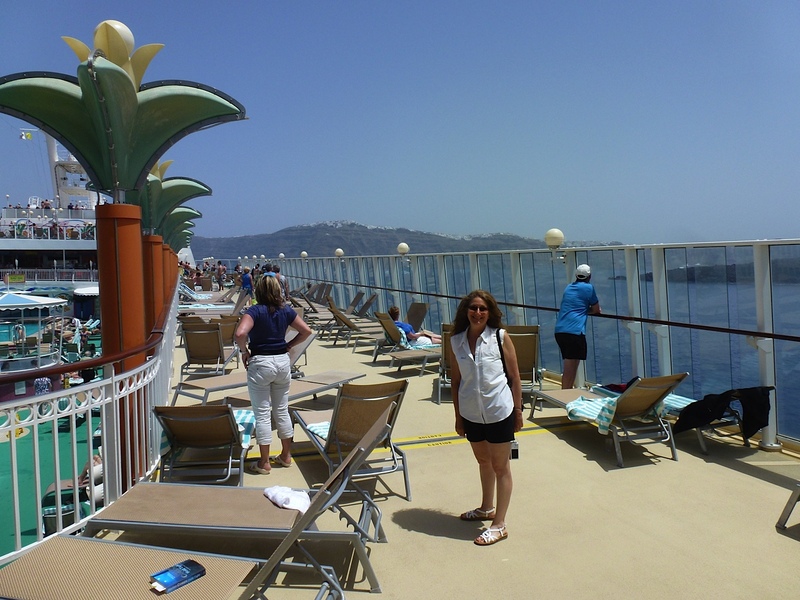 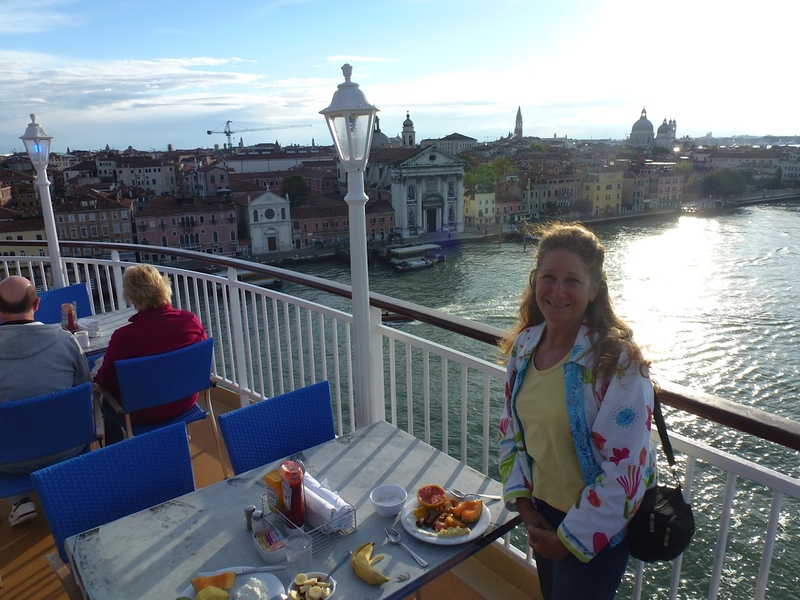 Lynn was also able to get us both $100 credits from HSN and Norwegian, by asking for cruise literature for us both on line. 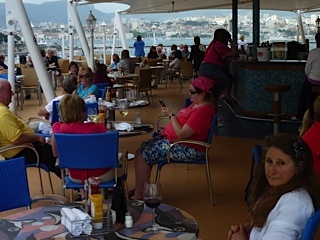 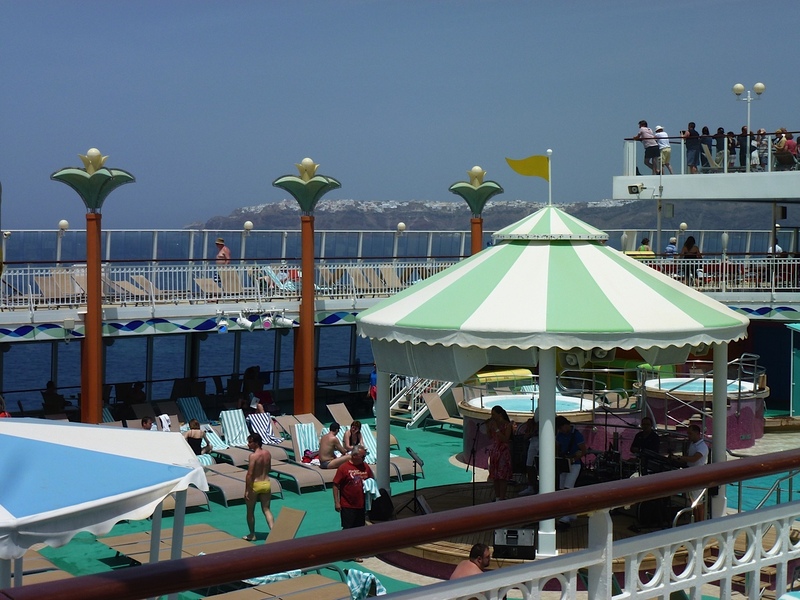 This is our third and fourth cruise with Norwegian our first was 11 years ago. 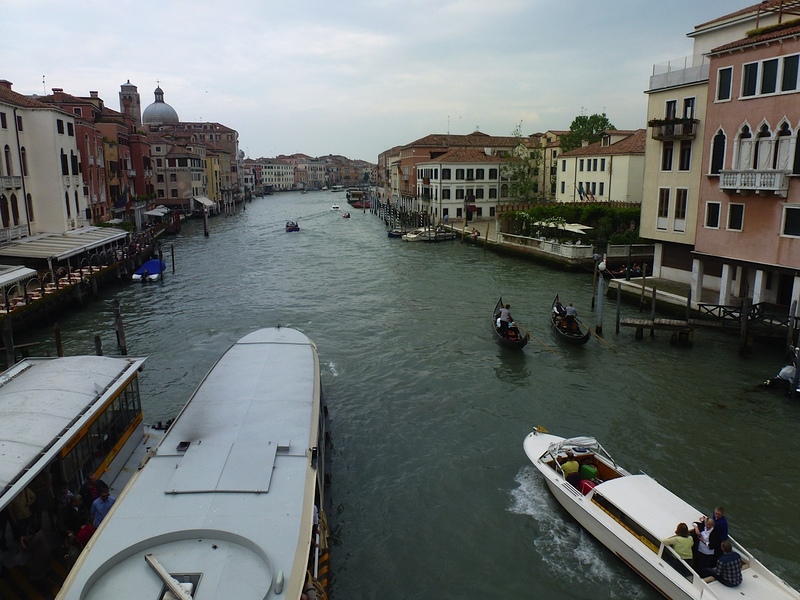 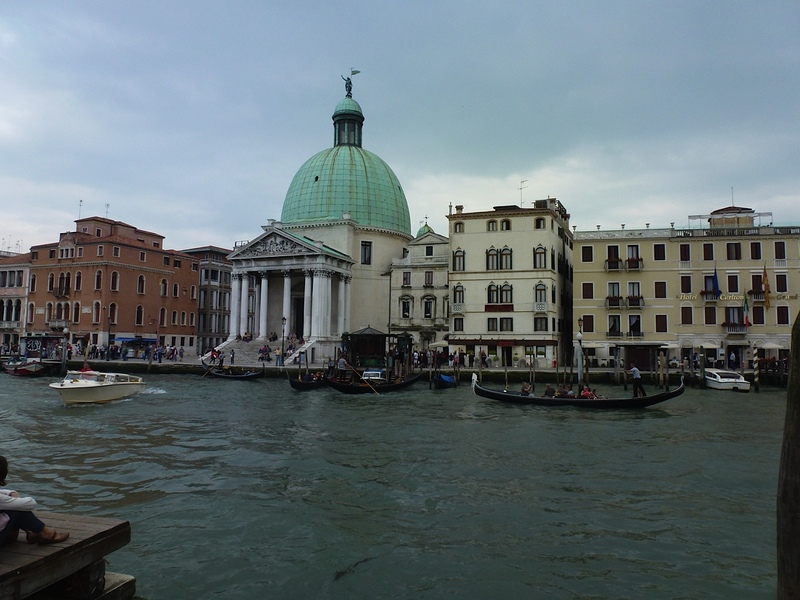 We flew Delta Detroit to JFK New York and landing in Venice. 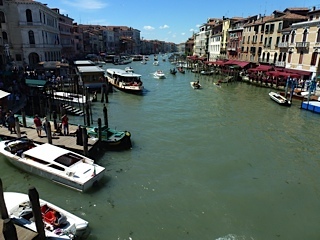 The flights were 1.5 hours and 9 hours plus layovers. The time difference was six hours later in Italy and seven hours later as we cruised further east. 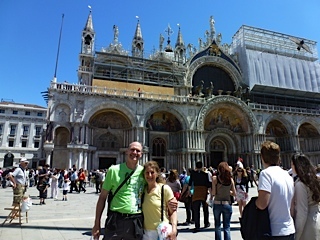 So we arrived in Venice Friday at 10:30 a.m. after leaving Detroit Thursday at 3 p.m.
After figuring what bus to take to our hotel and waiting for it to arrive for about 45 minutes (6 euro per person) we got to our hotel and took a three hour nap since we did not sleep more than a few hours on the plane. 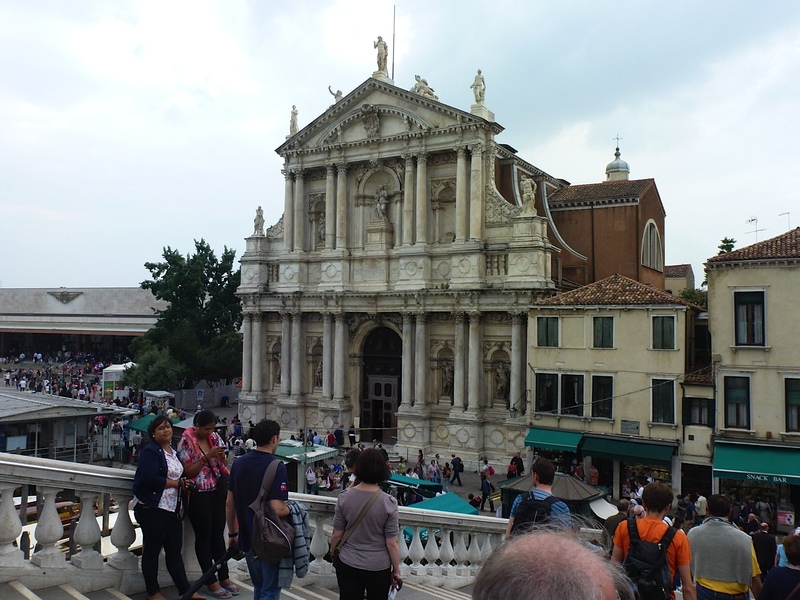 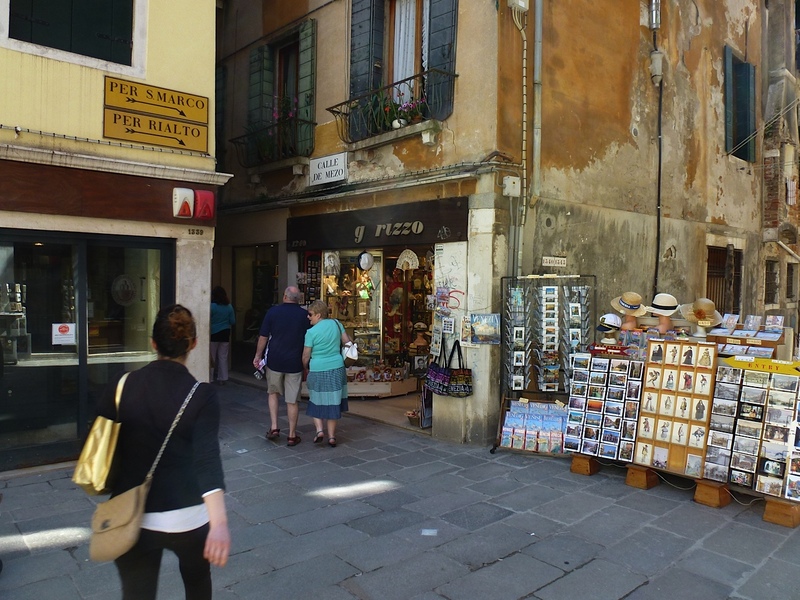 Once up and freshened up, we learned they sold bus tickets at the shop across the street, bought a couple tickets and headed to Venice via the bus (1.3 euro p.p.). 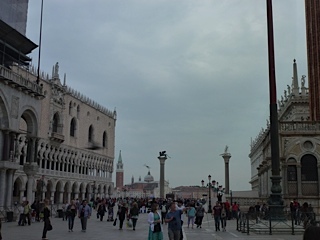 We walked around following the signs at most corners to keep us heading toward San Marco Square. We stopped for dinner (pizza, wine, beer) and used the Capital One debit card to get some euros out of an ATM. 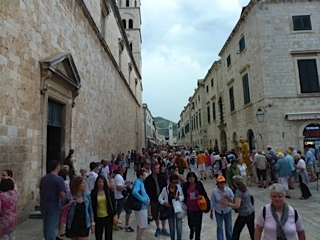 Most of the trip euros or local currency was taken but dollars, not too often. The exchange rate during our trip was about 1.3 dollars to get 1 euro. 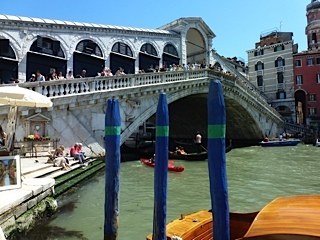 After exploring the streets, shops, sights and ending up at San Marco Square we bought tickets for the water taxi (7 euro p.p.) 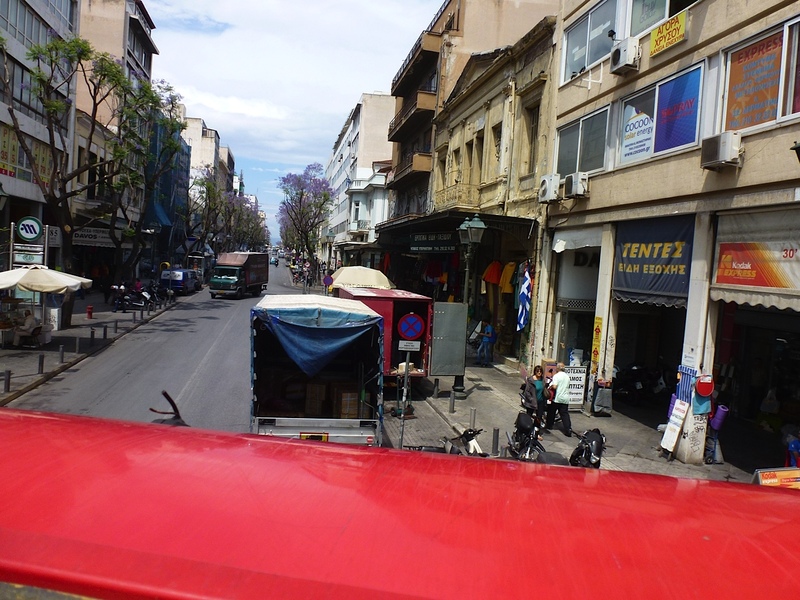 to come back to the bus terminal and headed back to the hotel for the night. 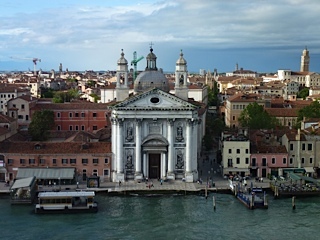 Venice was the only stop on this trip that we had been to before, and was in my top three stops on this trip as there is great sights around every corner. 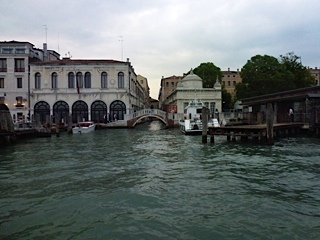 Too many pictures to take, and more than anyone would want to see, unless they took them themselves. 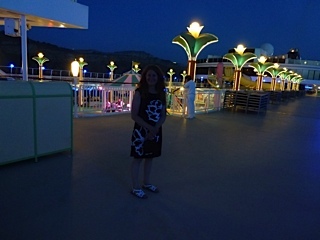 On this 16 day get away I ended up with over 700 pictures and Lynn had around 1,300 (this with us deleting as we went). 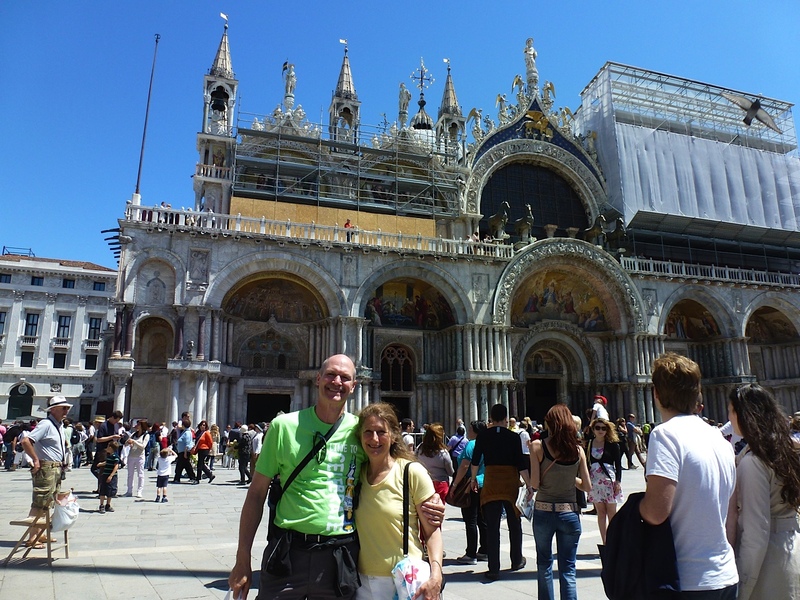 Between the cruises we walked around Venezia for about five hours, and I bought a t-shirt and a couple drinking glasses. 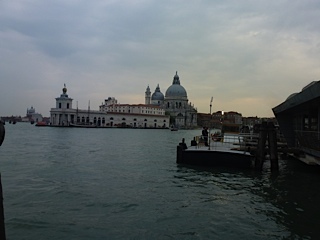 We ended up at San Marco and took a water taxi directly back to the cruise port for 8 euro each. 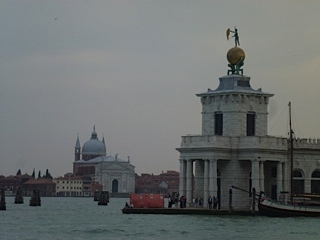 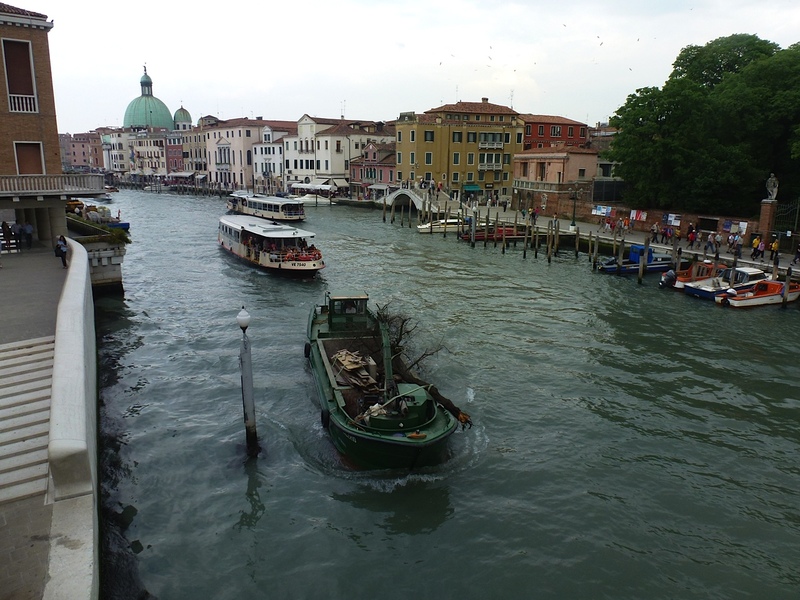 There also was a sign saying you could take a vaporetto from the cruise port to the airport. I believe the only airport you can take a boat to get to. 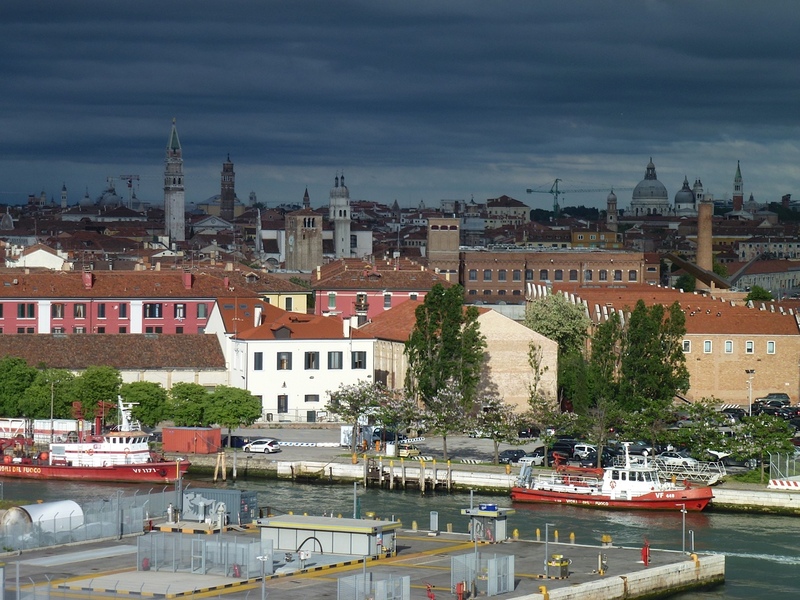 Ship' information - You could start a discussion about Venice by praising its restaurants, wine bars, marble churches or blown glass. 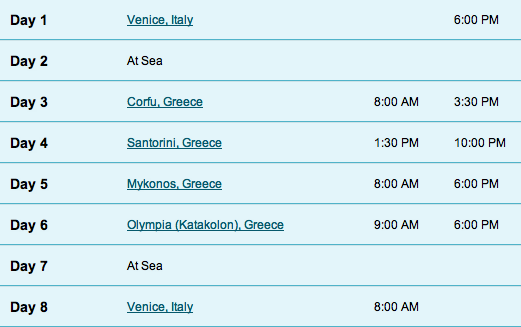 But you probably won't. 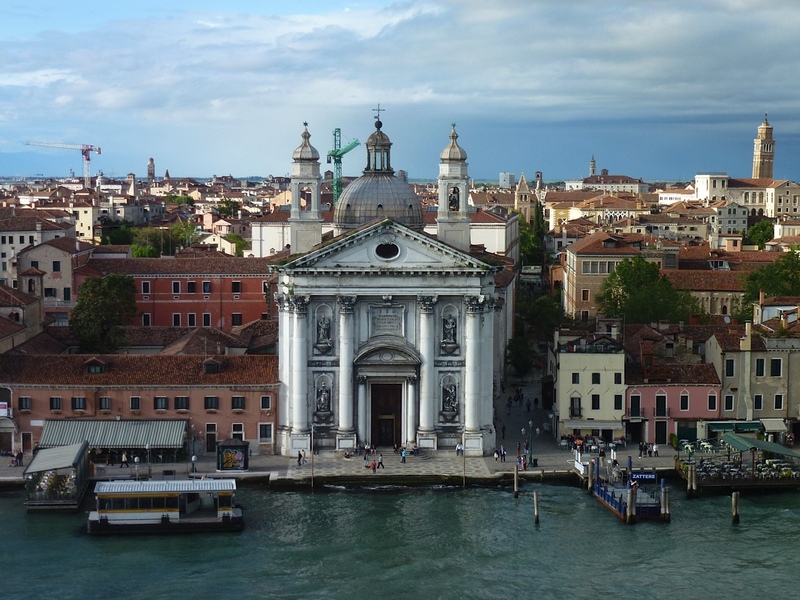 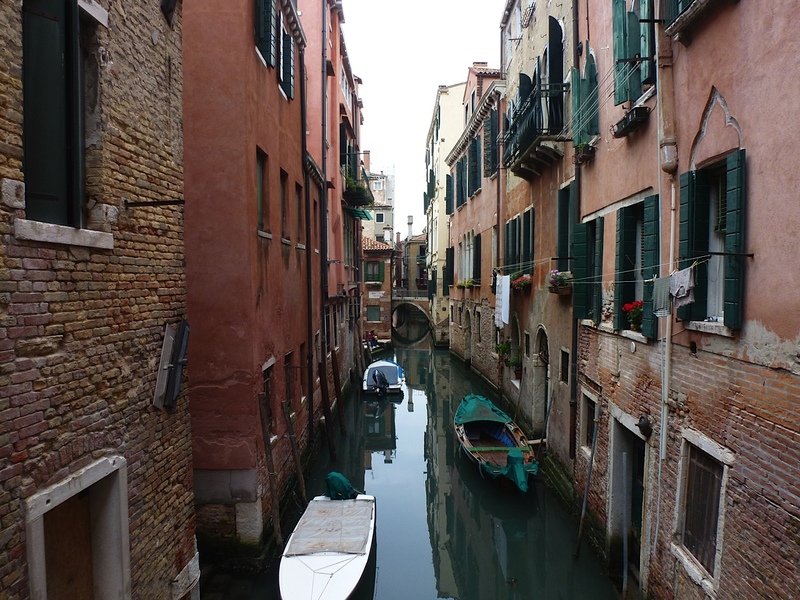 You'll likely start with the fact that Venice is built on water. 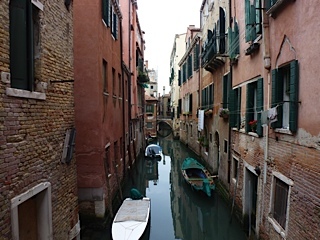 It is a place where people either float slowly down palace-lined man-made waterways or stroll down narrow alleyways. 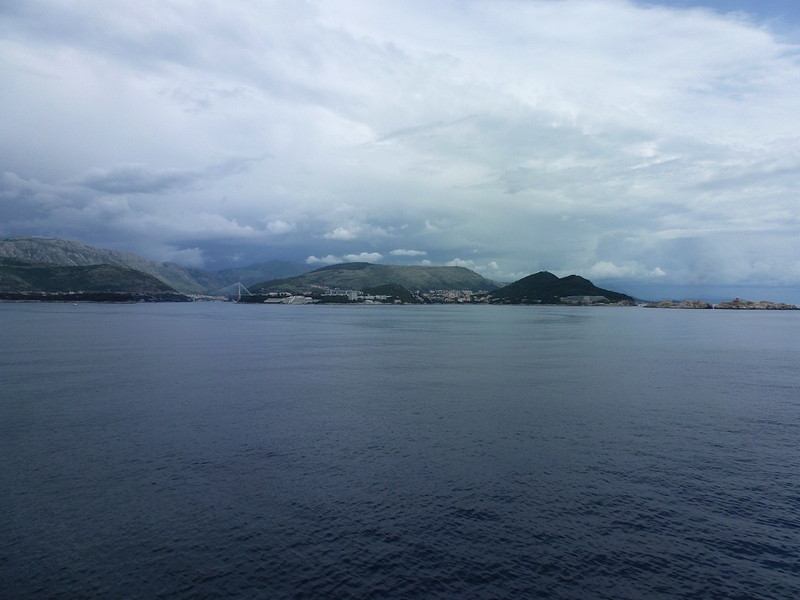 There's no more extraordinary place to find yourself, or lose yourself. 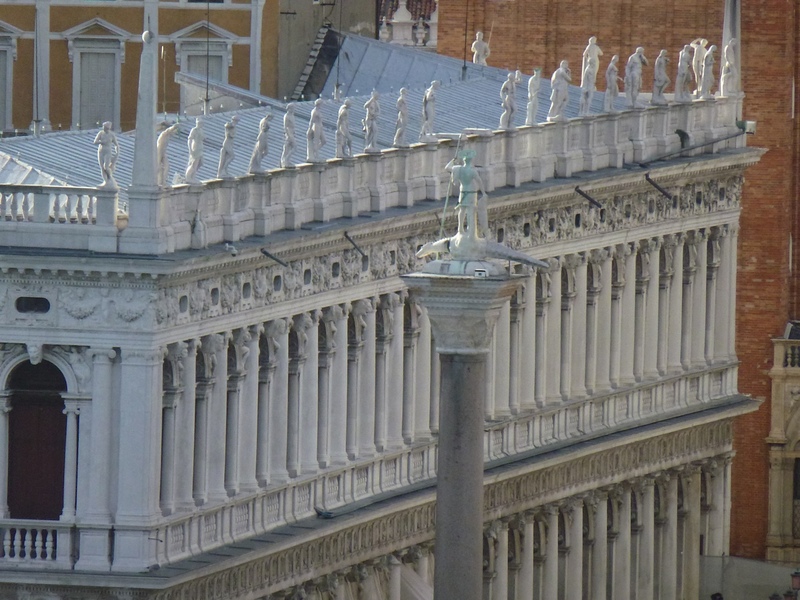 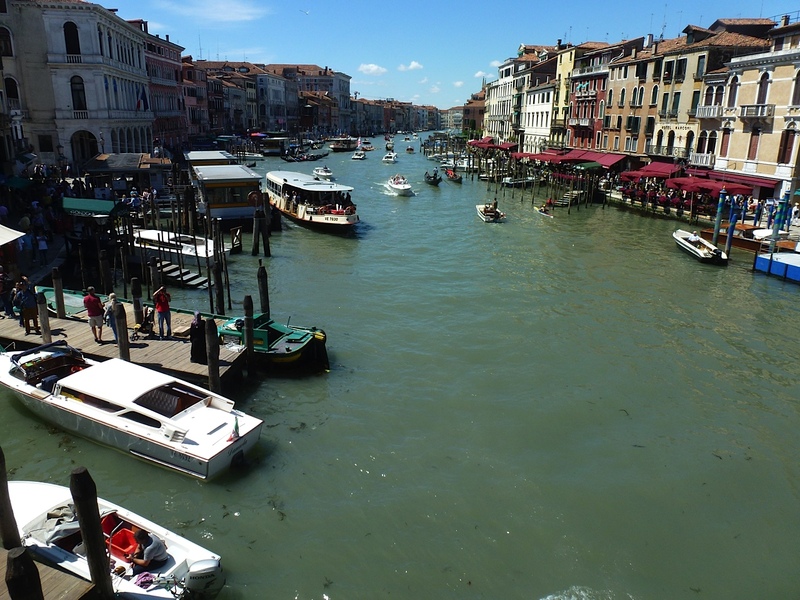 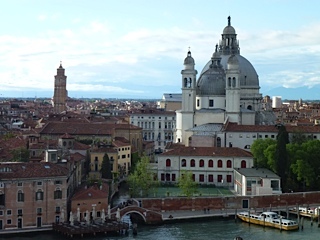 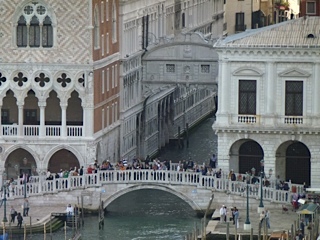 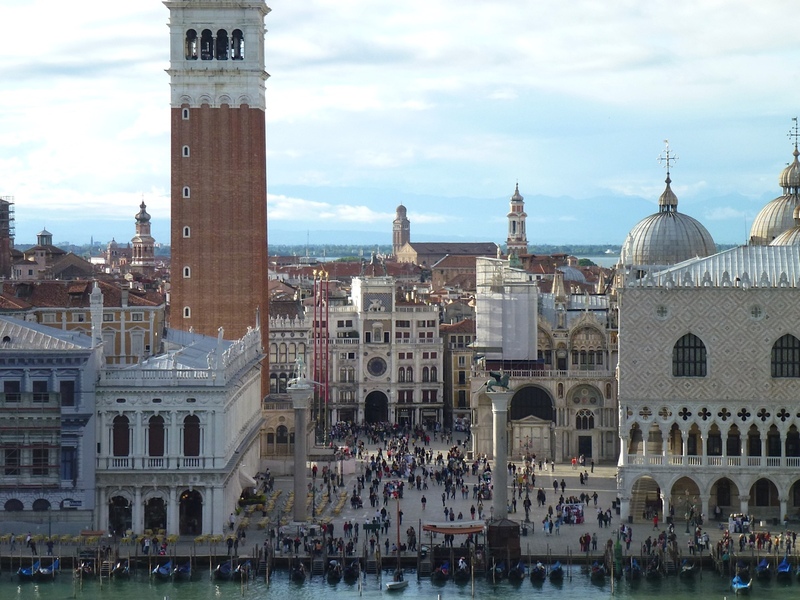 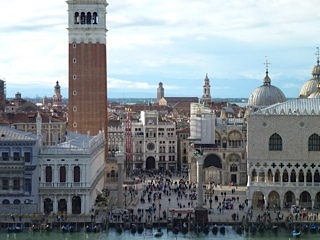 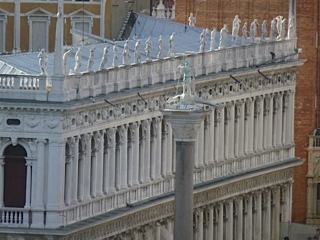 Be sure to stay in Venice before your next European cruise. 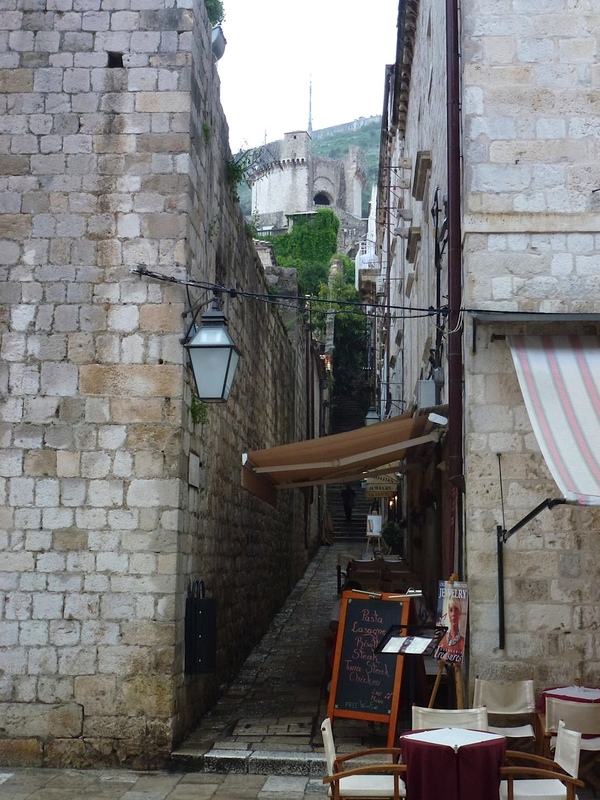 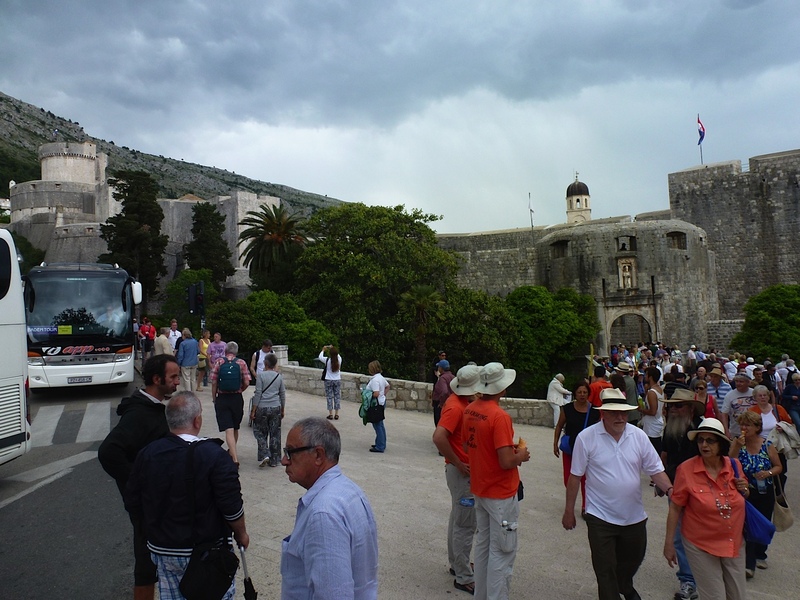 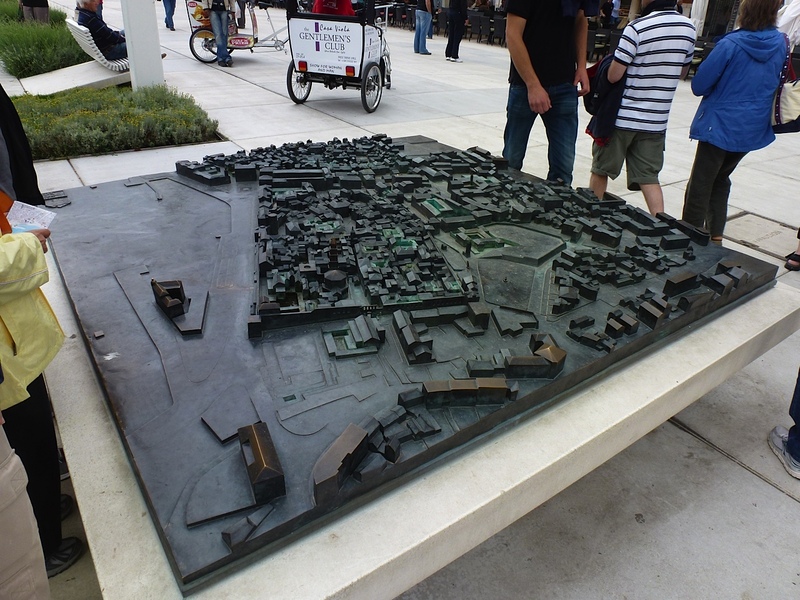 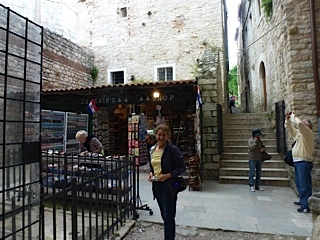 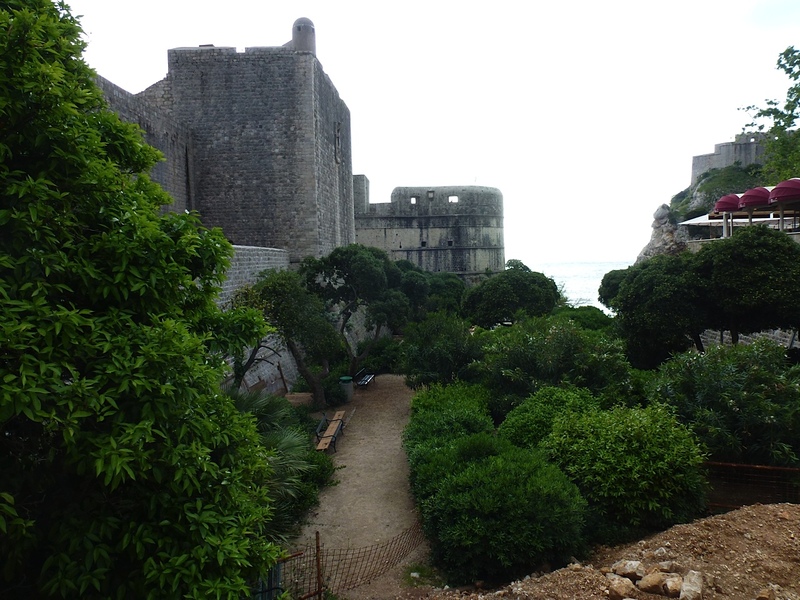 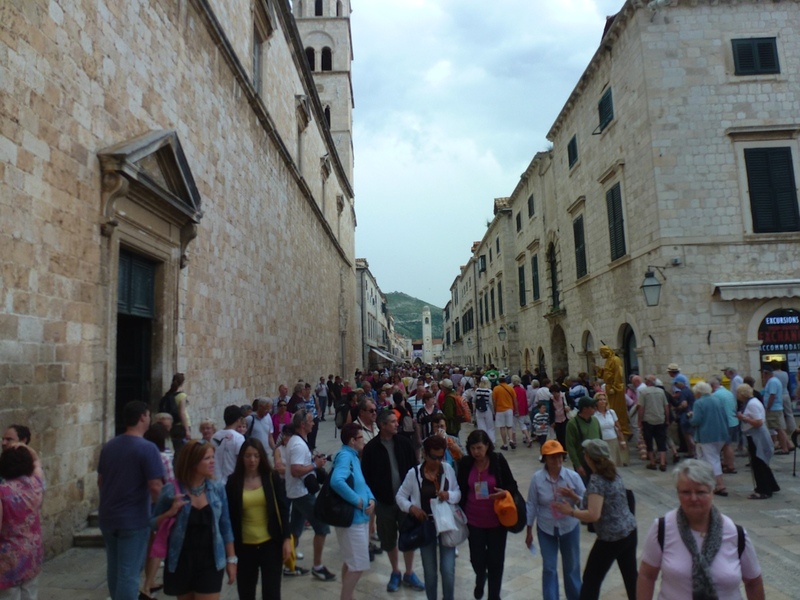 We took the local bus into Dubrovnik to see the old walled city, around 2:45 finding out that they would not take euros for the bus tickets, but only Kruners. I put in the wrong code when using my ATM card and got locked out, so I exchanged $20 dollars which gave us around 110 kruners, enough for bus fare (24 each round trip), ice cream, etc. It was an overcast day around 68 degrees and we started exploring for about an hour before it started to rain. 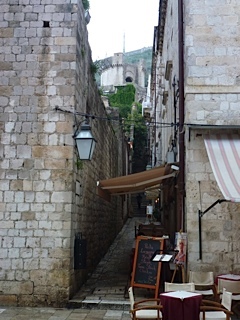 The ground we covered revealed nice walls, streets, shops and restaurants. Then it rained harder and we had to look for cover. 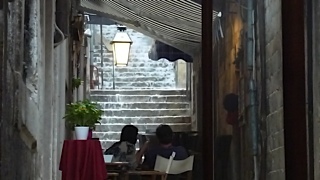 We hid in a side walkway at a table with umbrella at a closed restaurant and waited about half an hour, as the rain got heavier until the walkway we were at with a walkway at one end became a river and we had to lift our feet to keep our shoes from getting soaked. 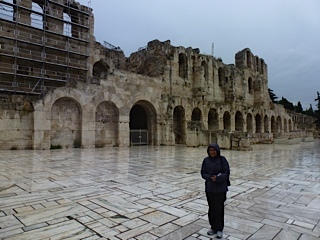 When the rain let up a bit, we made our way in some shops and bought rain jackets that came in a small clip on plastic ball with a thin plastic parka inside (4 euro each). 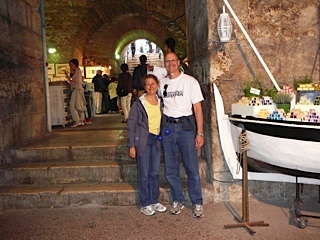 After trying to explore the Placa a bit more, hiding under archways, touring the synagogue (the oldest Sefardic synagogue still in use today in the world and the second oldest synagogue in Europe, but haven't had enough members for a minion or rabbi in 6-7 years) and in stores, we gave up to the rain and headed back to the ship via the bus. Later in the afternoon it stopped raining and we heard the views from the top of the walls were beautiful. 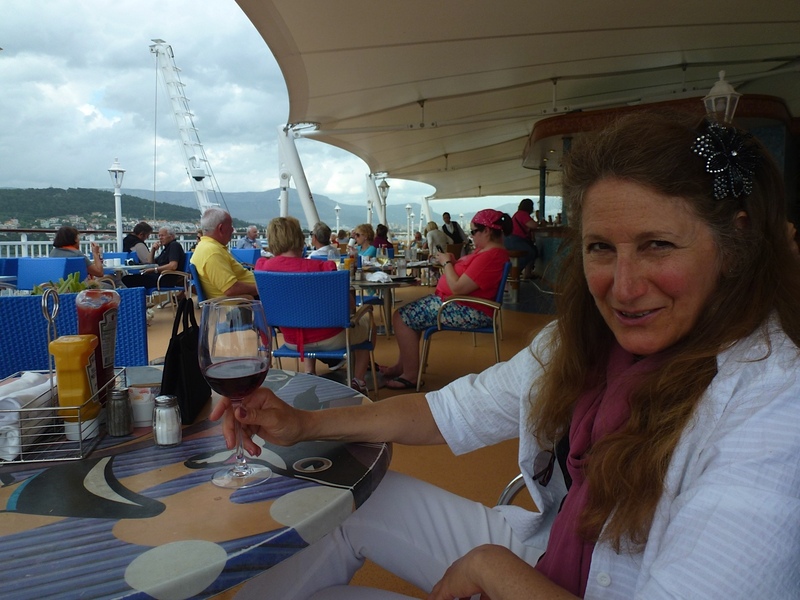 This was mothers day and I told Lynn to pick a gift for herself, which she did in getting a fun Britto wallet in the ships gift store. 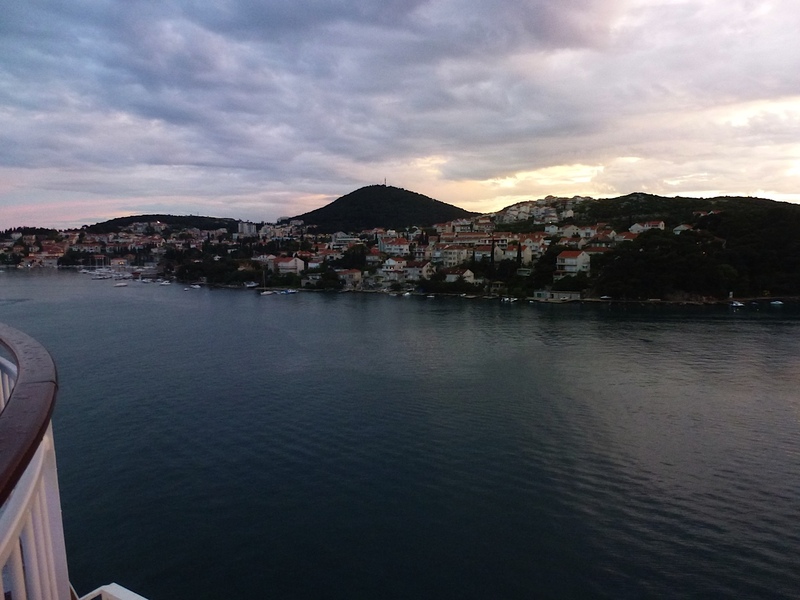 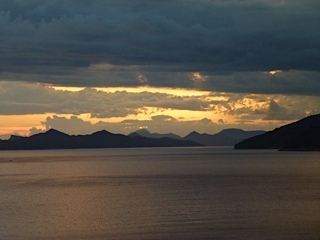 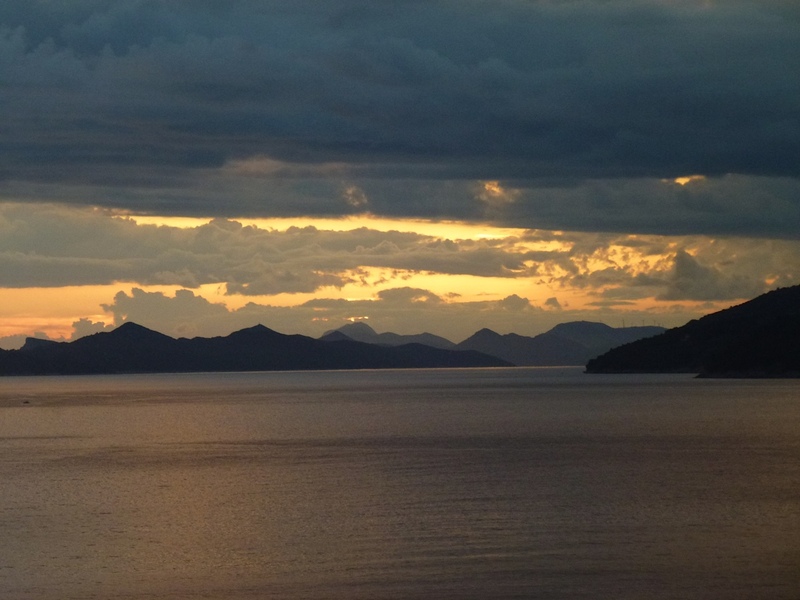 Unusual for us, but with the time change and since we were arriving at Dubrovnik at 2 pm and the next day was a sea day, we slept in until and didn't get out for breakfast until 10 both mornings. 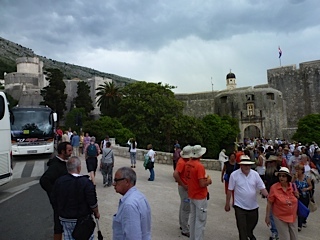 Ship' information - Despite the magnificent 13th century walls that surround the city, Dubrovnik is one of the most welcoming cruise destinations in all of Europe. 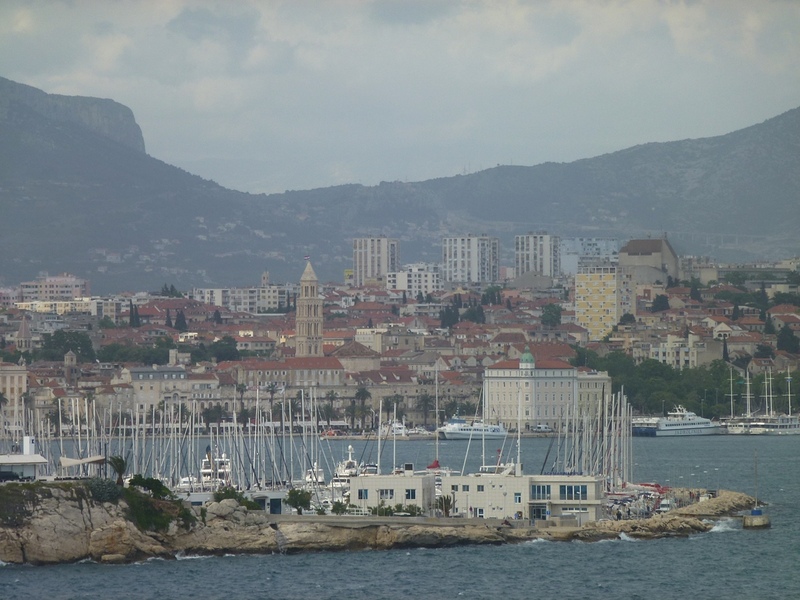 Dubbed "the pearl of the Adriatic" by the poet, Lord Byron, this Croatian city exudes romantic charm and beautiful scenery with its shimmering marble streets, centuries-old buildings capped by bright orange roofs, and lovely beaches ensconced between awesome rocky ledges. 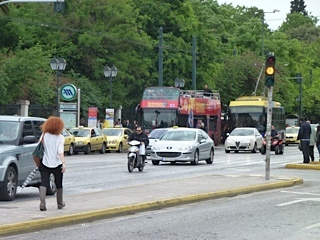 Up early with plans to take the bus to the metro train but since it was raining again, decided to do the hop on, hop off bus to stay out of the morning rain (20 euro p.p.) 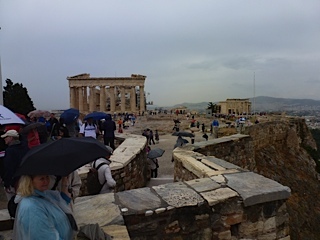 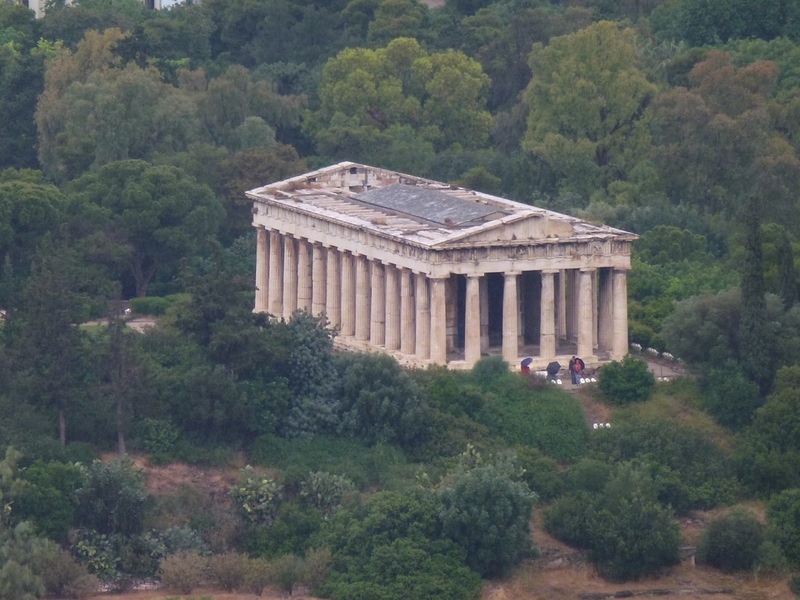 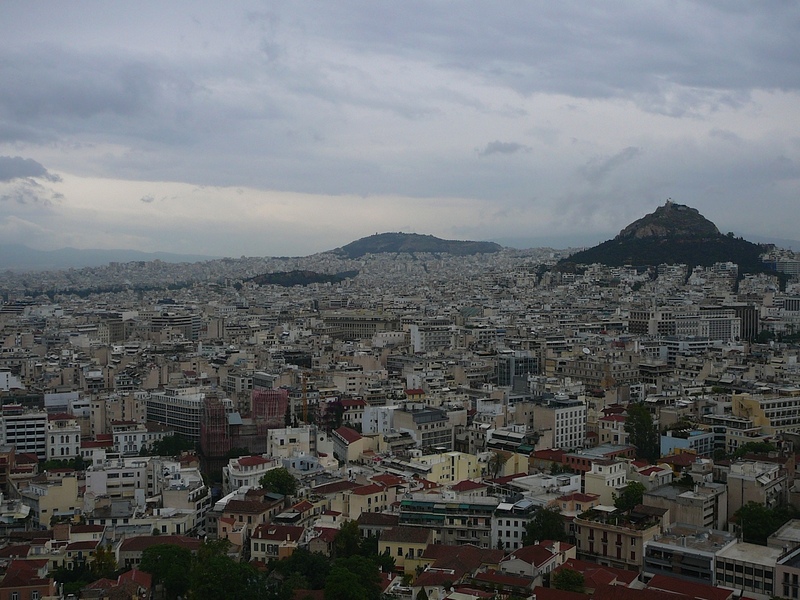 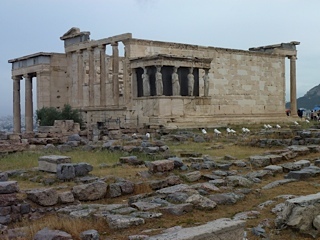 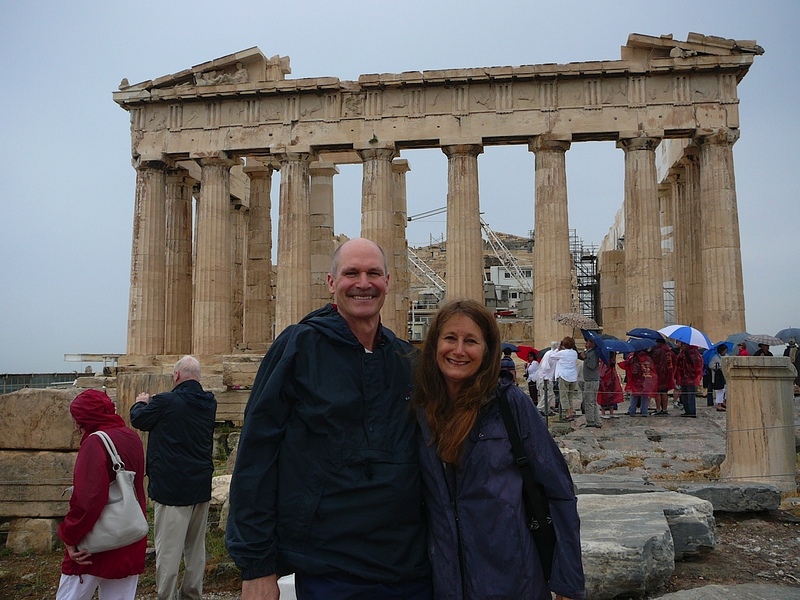 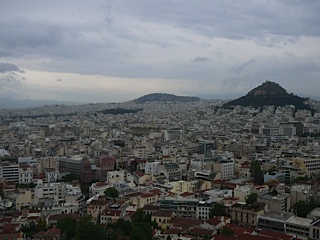 and went to the Acropolis, Parthenon, the temple of Athena Nike, and the Erechtheion (447-406 BC). 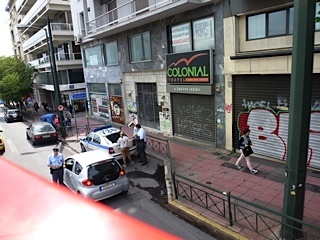 Another 12 euro p.p. 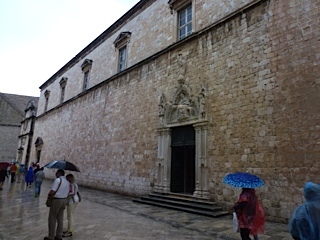 to get in and then we explored in the rain. 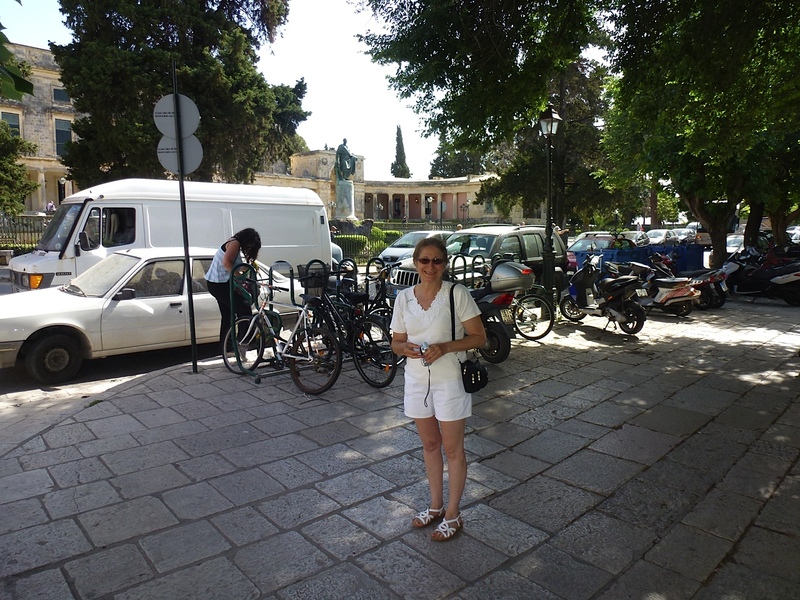 After we went to the (old town) Plaka where I purchased my first t-shirt of the trip (Cruising the Aegean Sea, Greece) for 12 euro and Lynn bought some soaps. 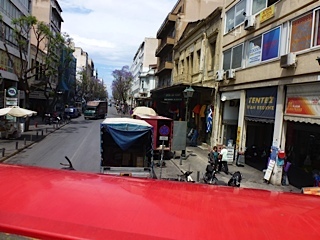 We then got back on the hop on, hop off bus on the red line loop (past 15 stops, like Parliament, National Library, National Gardens, Museums, etc.) 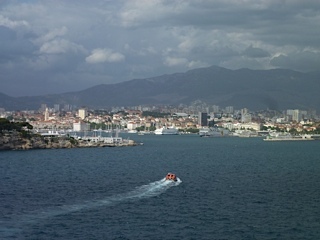 and then got on the blue line past other sights back to the Cruise terminal. 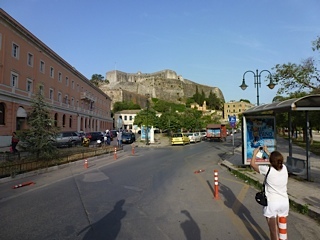 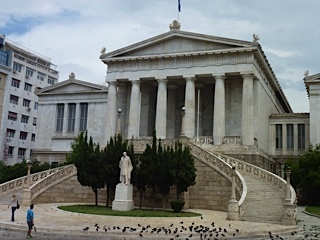 Athens was interesting with nice areas, but was busier than we would want to stay in, and seemed to have graffiti on most streets. 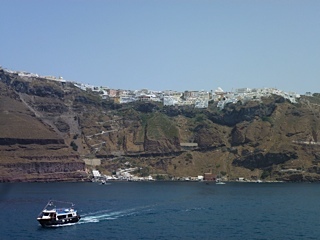 Ship' information - This is the cradle of civilization, the oldest city in Europe. 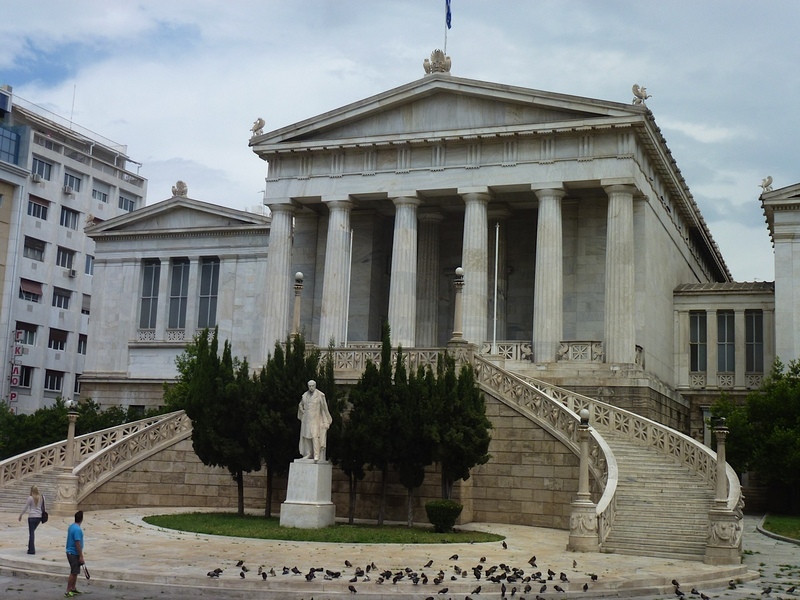 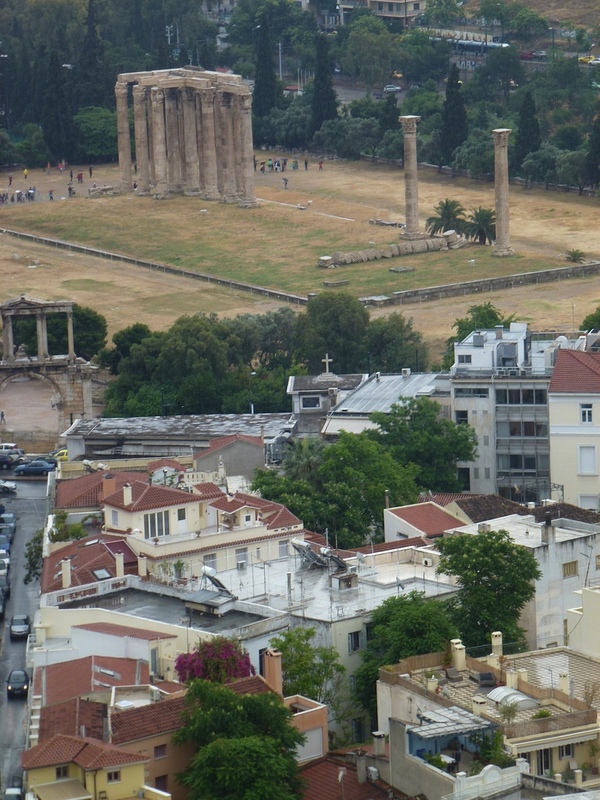 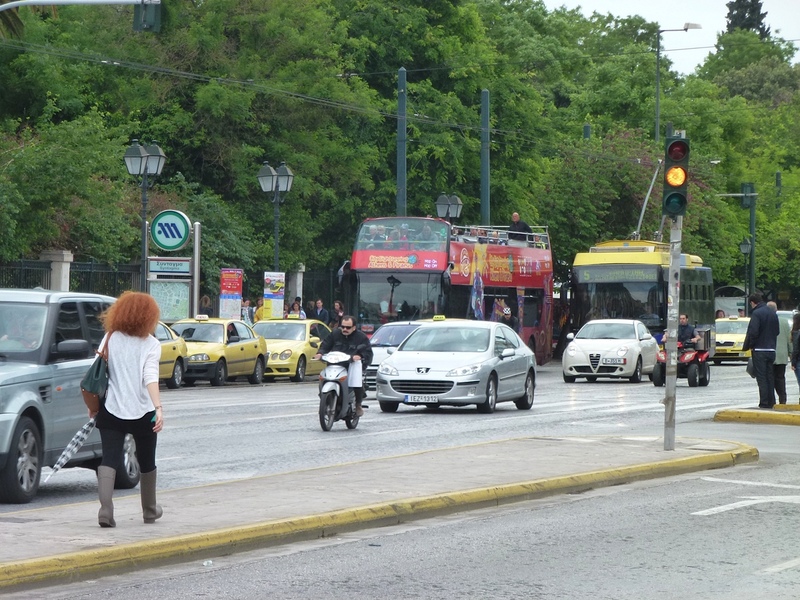 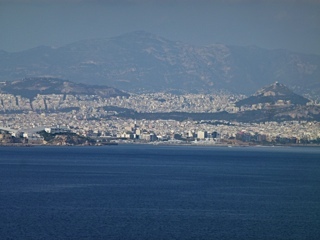 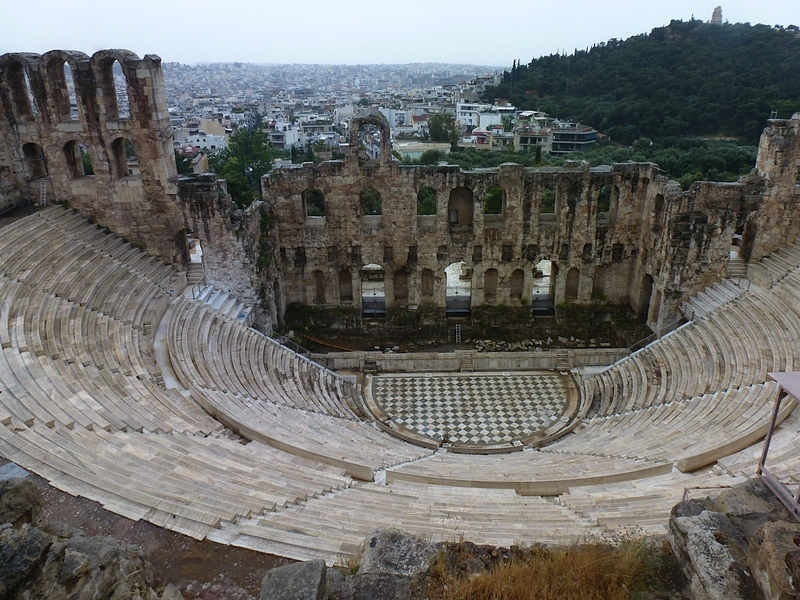 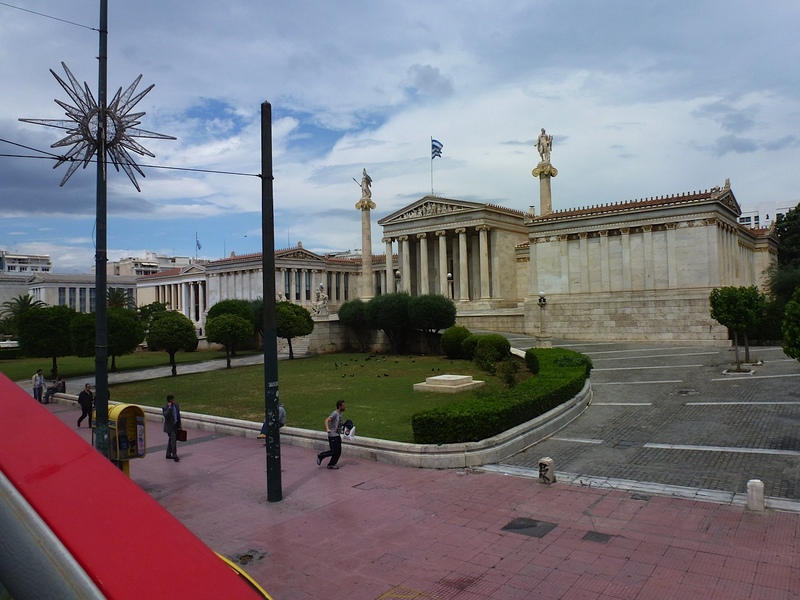 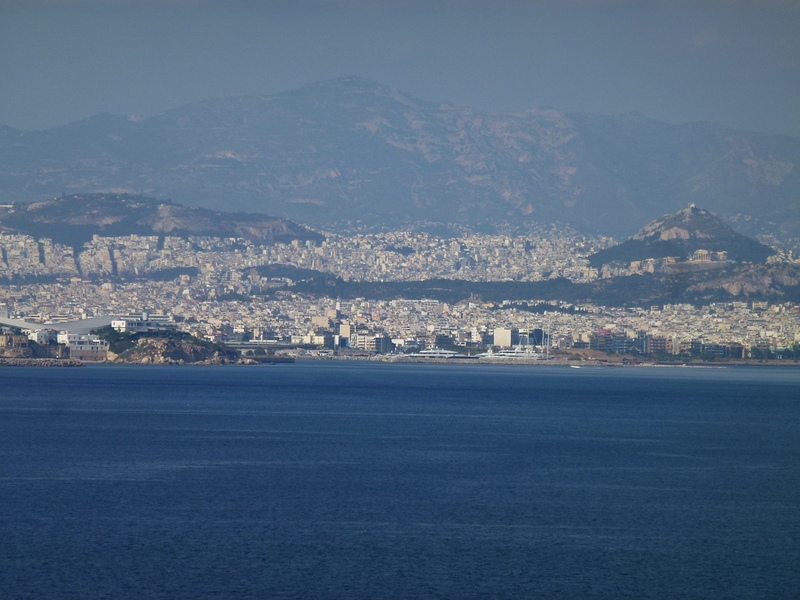 Not only is this city home to the Acropolis and some of the most important architectural structures and archaeological finds in the Western world, It is also a very modern city, an urban amalgam of extraordinary art, culture, cuisine and shopping. 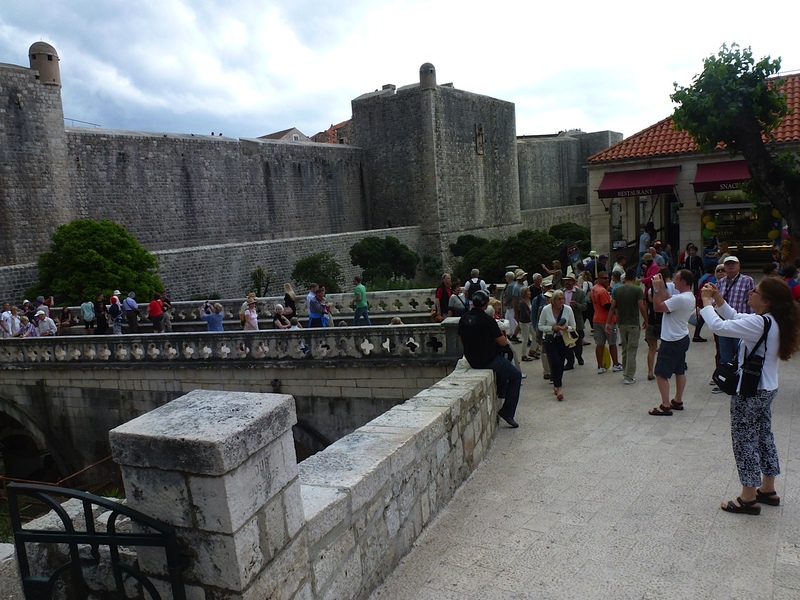 The tour was great and Tez educated us along with two women from Manchester, England. This excavation has been going for a long time (50 years in earnist? 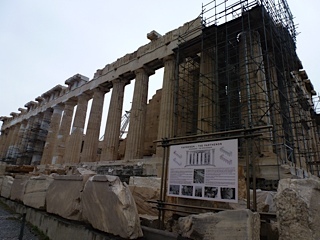 ), and will be going for a lot longer as they meticulously restore the site. Once a port city, but the water is miles away now. 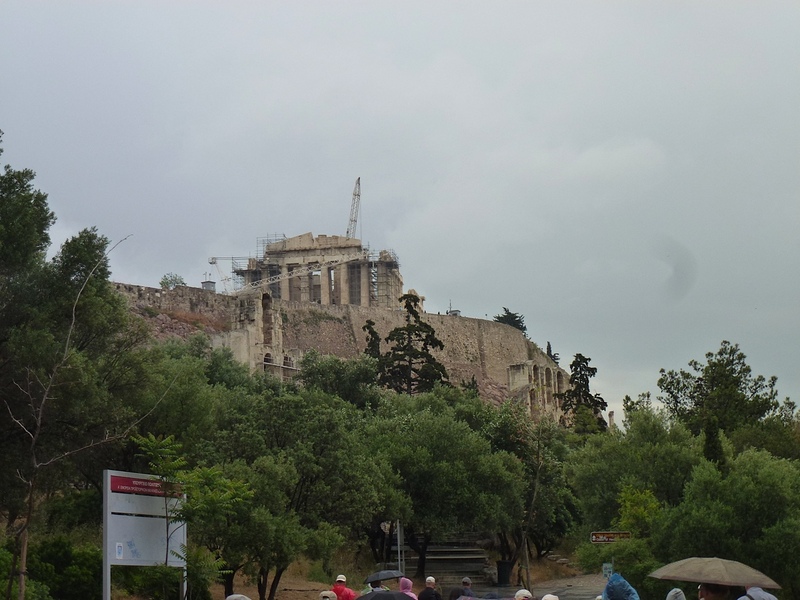 I believe this is the second largest excavation site in the world. 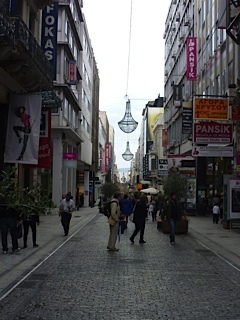 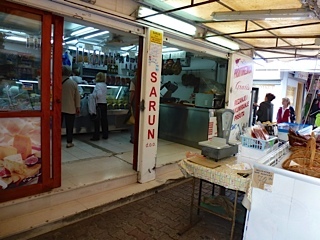 We were in the Aegean Region of Turkey which is the most multicultural and reformed region of the seven regions of Turkey, probably due to it having a major port city with trade with other nations helping diversify the area. 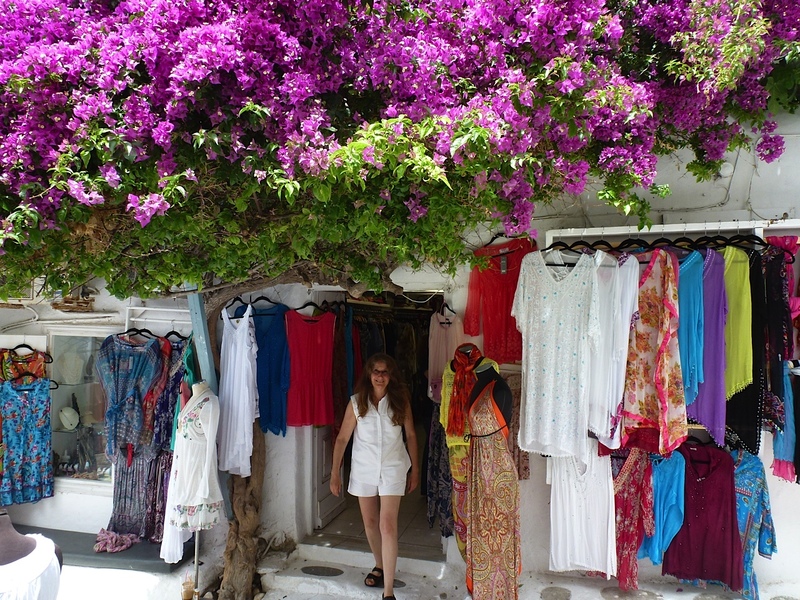 Some areas we would not want to go to as they are very religious with strict dress, and customs that would not mesh with our independent thinking lifestyle. 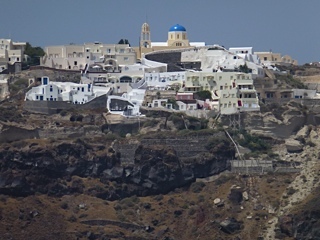 In the Aegean region I believe they have call to prayers once per day with nothing mandatory, in some regions call to prayers are six times per day and dress and roles are not optional. 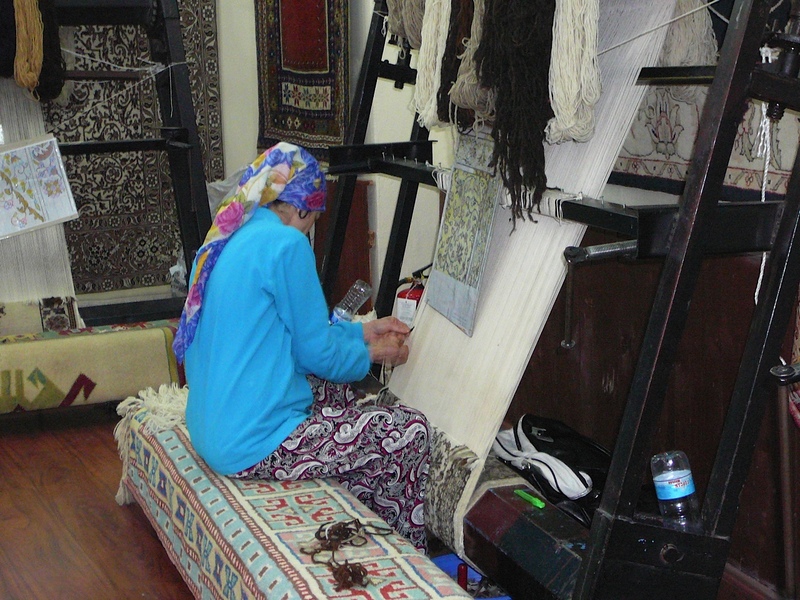 After our tour, we stopped at a rug store where they hire thousands of independent rug makers and demo'ed how they made the rugs by hand. 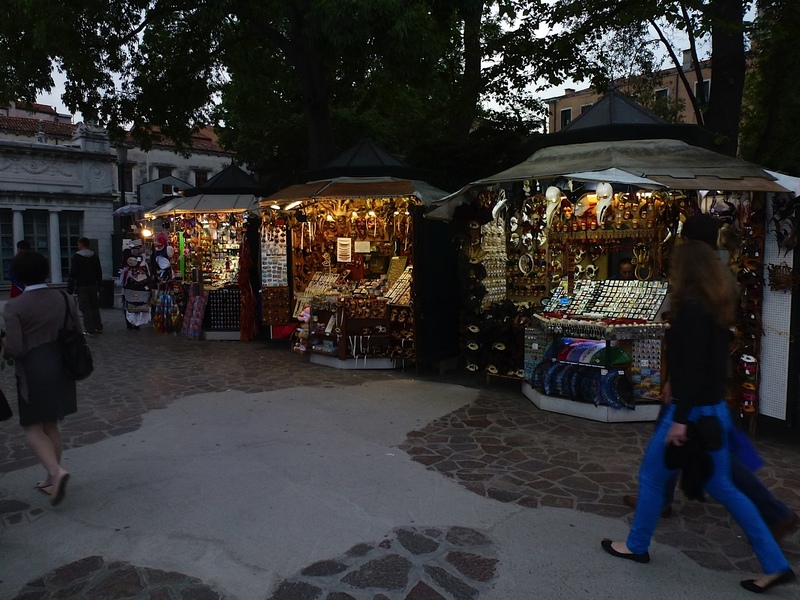 They were very nice rugs and affordable (well from hundreds to not affordable) but we were not looking to buy and ship a rug home. 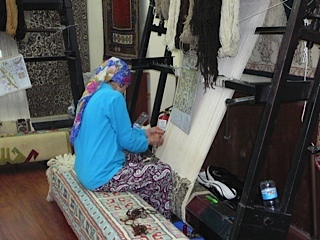 Labor cost must be a lot lower as the demonstration they gave us involved at least four different people and they unrolled, explained the differences (styles, cotton, wool, silk), let you walk on the rugs, gave you a drink, and had to roll the 20 or so rugs they unrolled back up and put them away. 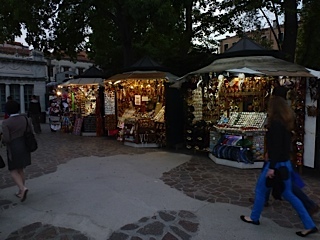 I believe these rugs took months to years to make, depending on size, style, and material. 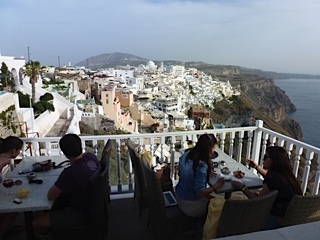 This was a great day with temperature around 74 degrees and on our way back to the ship we stopped for baklava and some small honey soaked donut holes (best I can describe them). 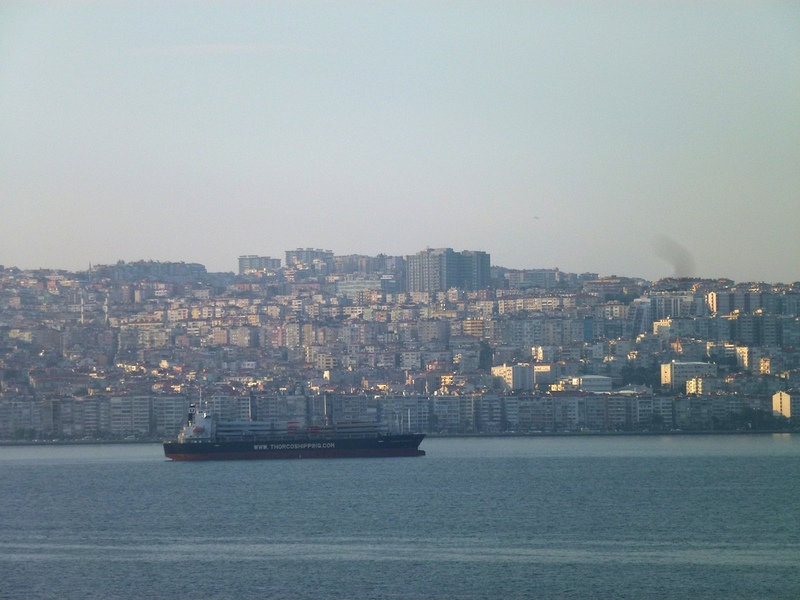 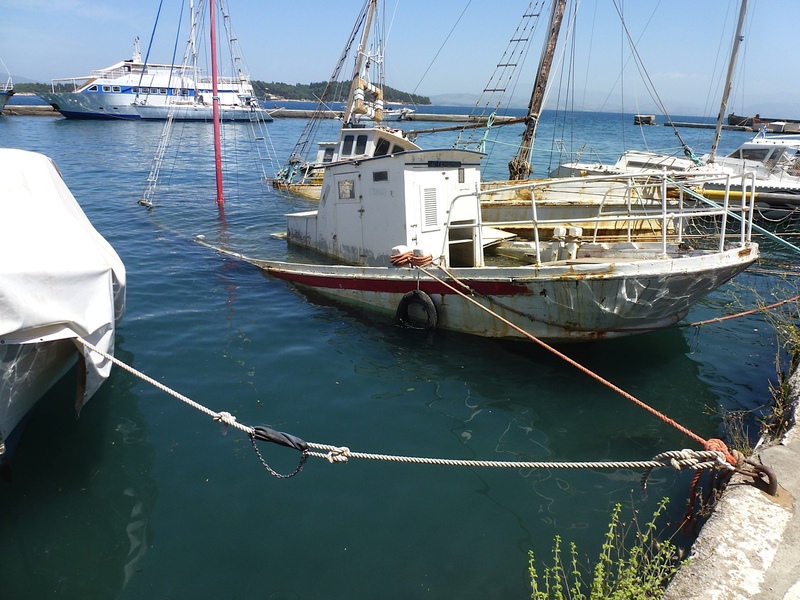 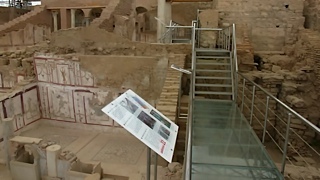 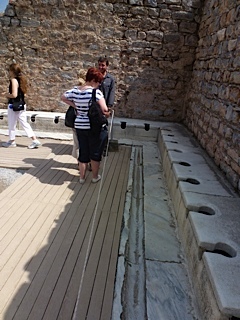 Ship' information - Archaeologically rich, historic Izmir dates back over 5,000 years. 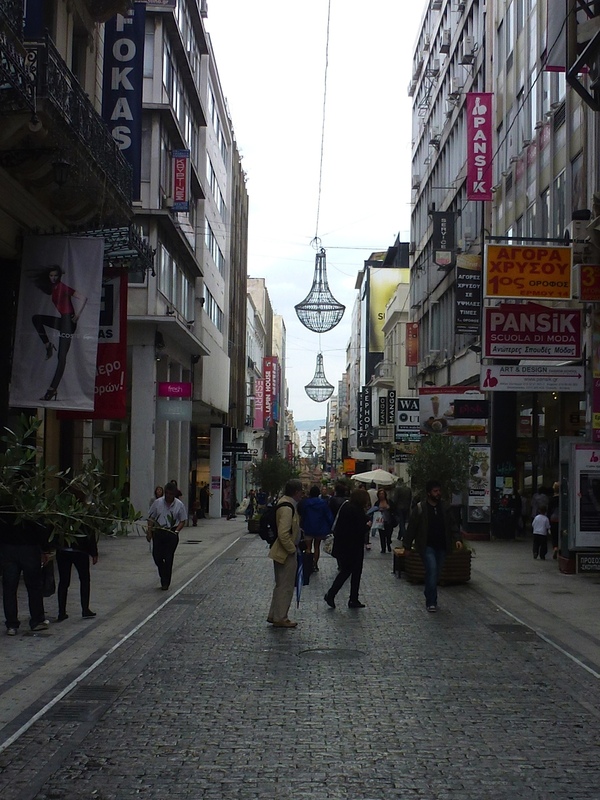 Virtually rebuilt from scratch in 1922, Izmir is a booming city today. 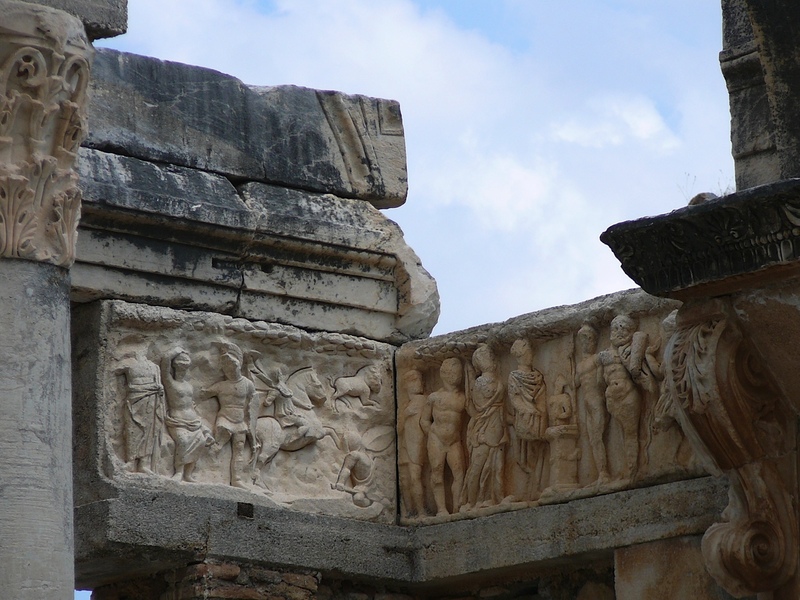 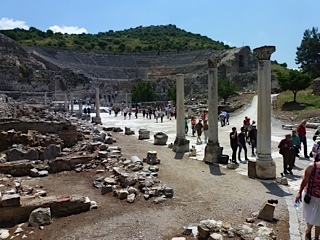 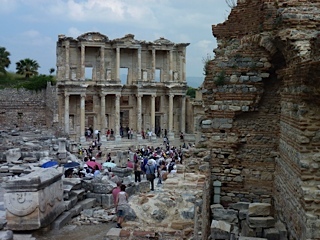 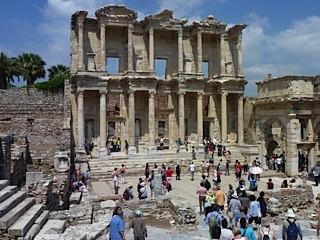 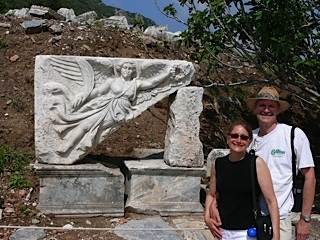 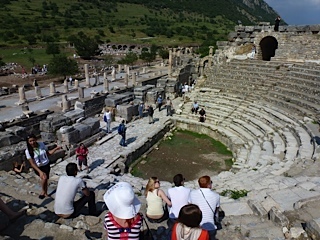 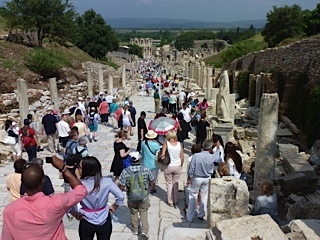 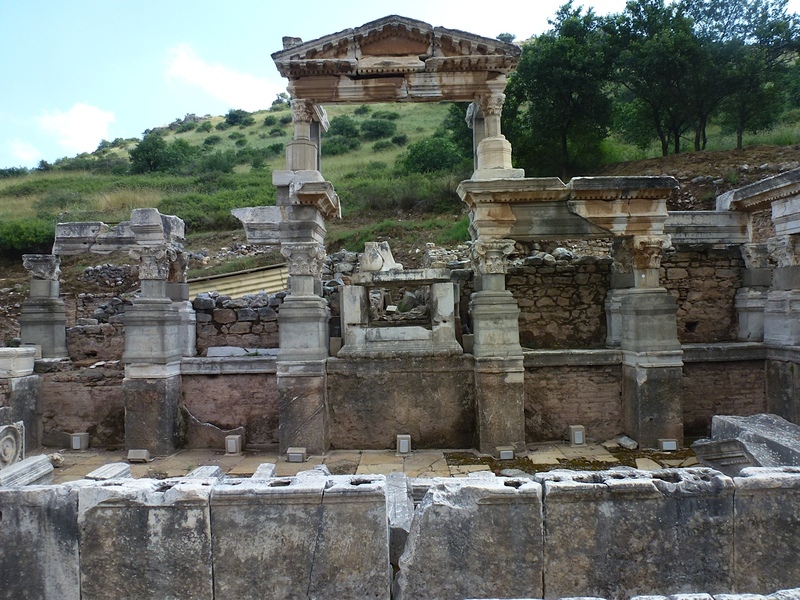 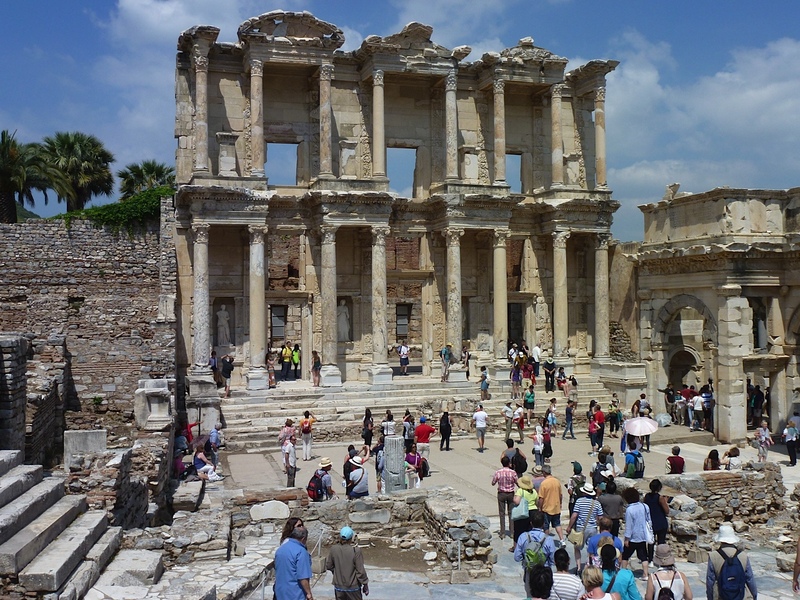 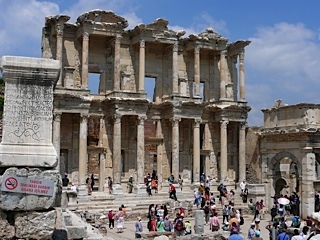 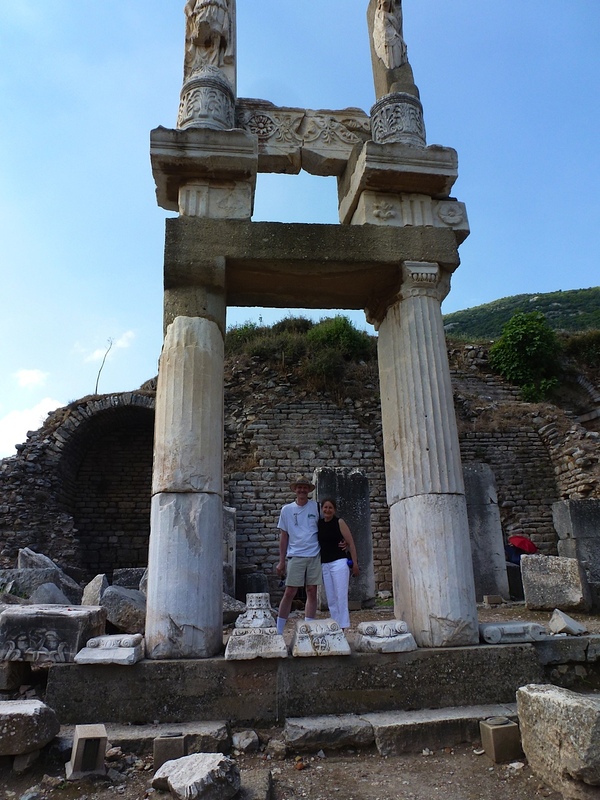 The ancient city of Ephesus, home to the Artemis Temple and the Zeus Altar, is one of the world's best preserved archaeological sites. We had to tender at Split, and were the first tender to get to town. 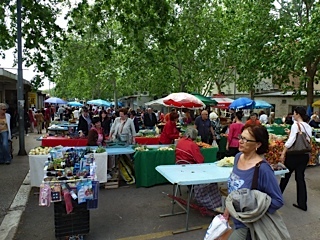 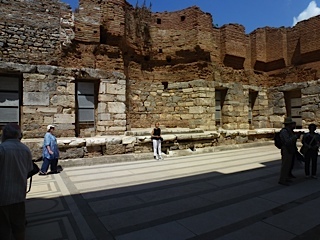 We walked around the palace, walled area with many shops, a nice fresh food market, clothing and whatever else you needed. 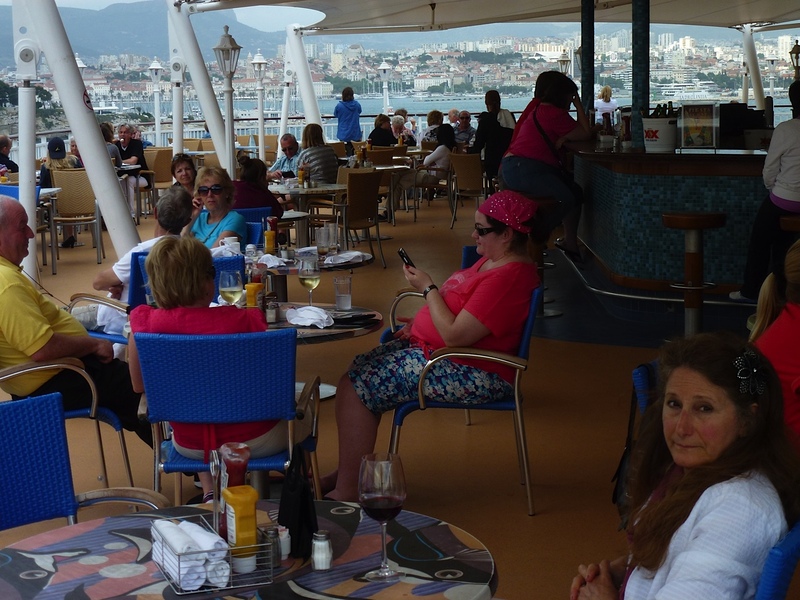 There was a political rally going on, and we explored and then went back to the ship for lunch and to dress cooler as the weather warmed up. 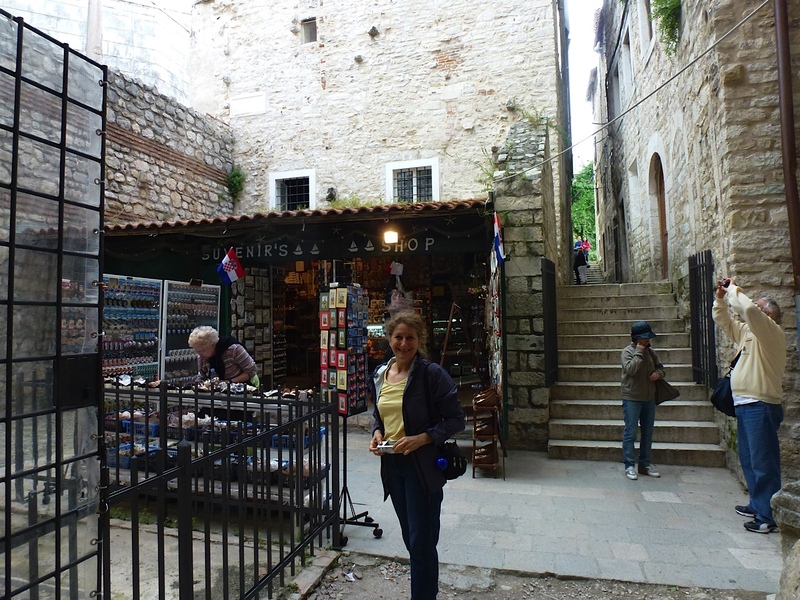 Lynn bought some lavender & sea sponges here and I got a red t-shirt with the alphabet. 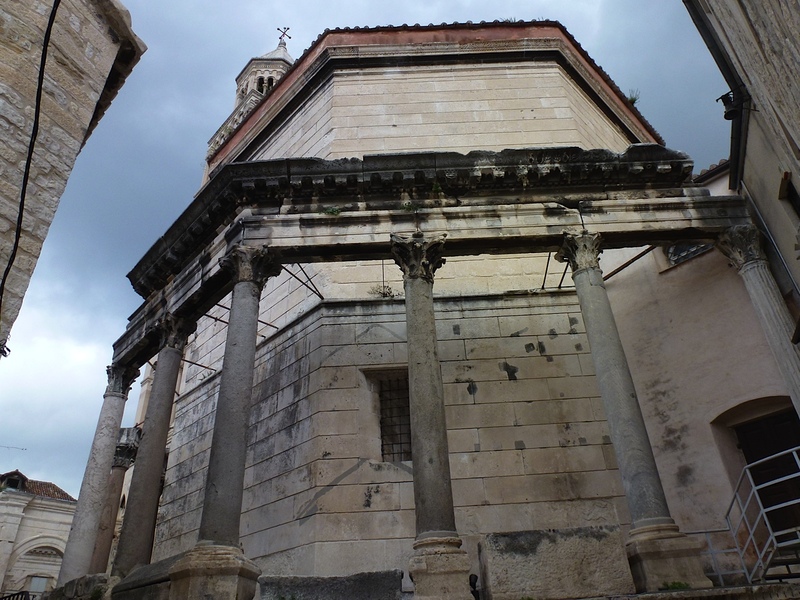 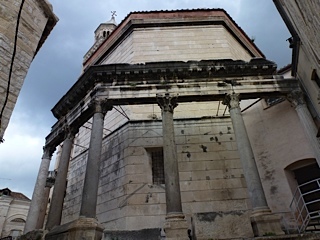 Ship' information - This Mediterranean city on the eastern shores of the Adriatic has a long and eventful history dating back to the awesome Diocletian's Palace (circa 295 A.D.) in the center of the city. 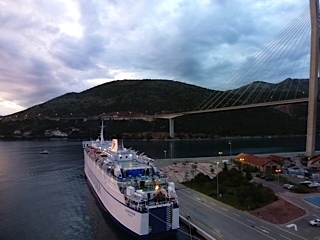 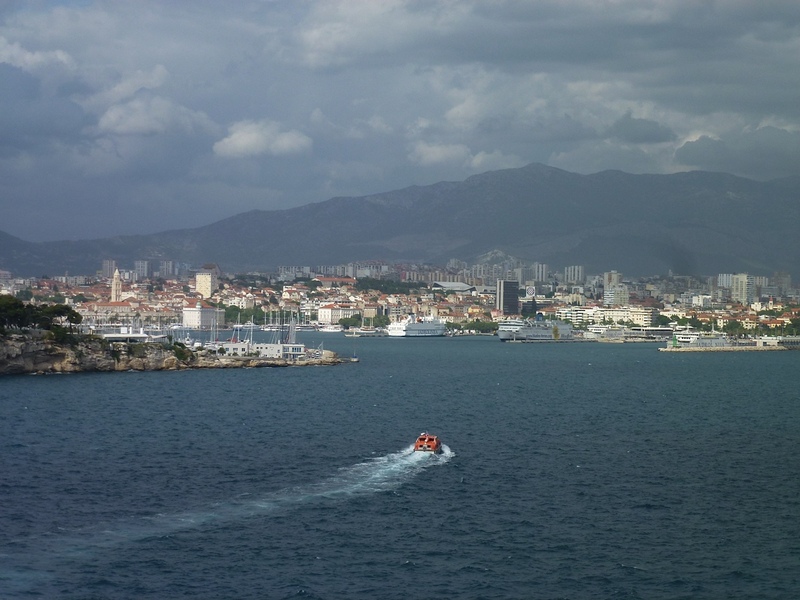 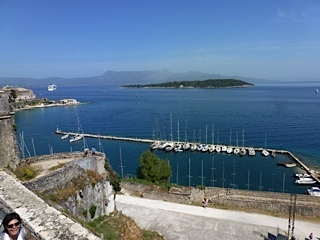 Split offers cruise guests a wealth of exciting places to visit, from the majestic cathedral and marble streets in the center of town to the harbor area with its cafe-lined promenades and views of coastal mountains. 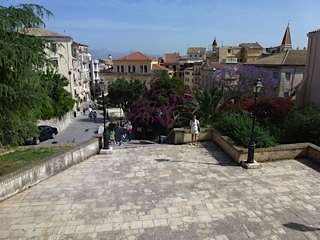 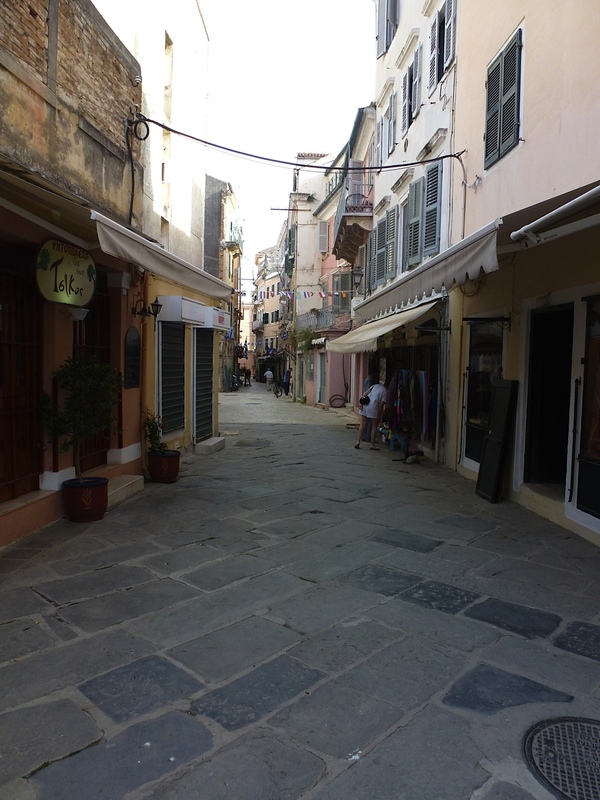 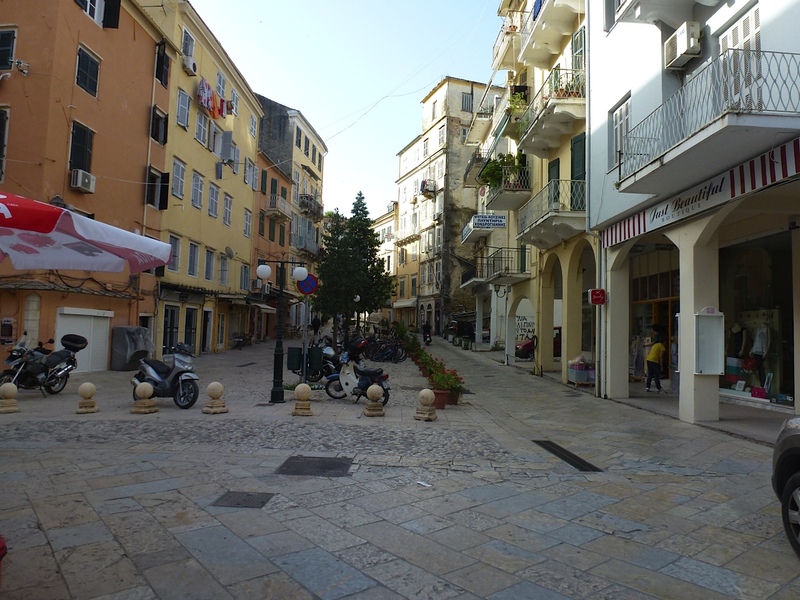 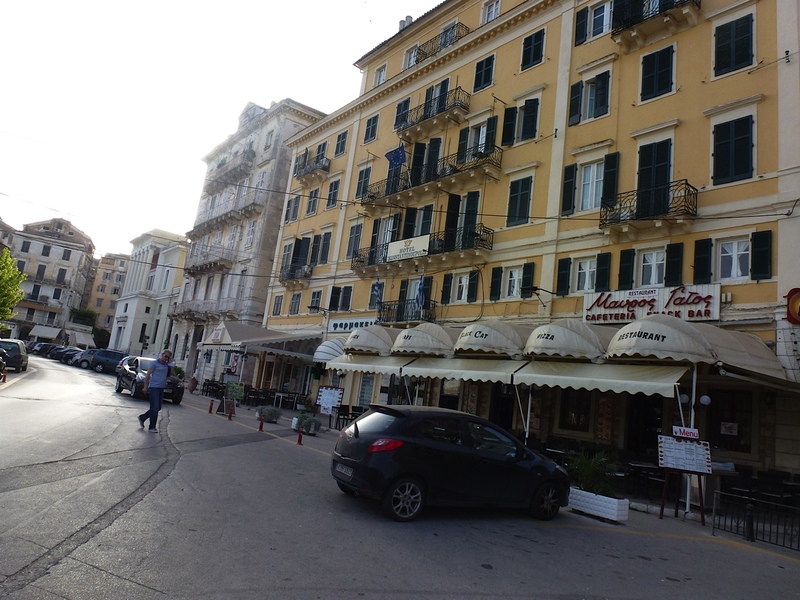 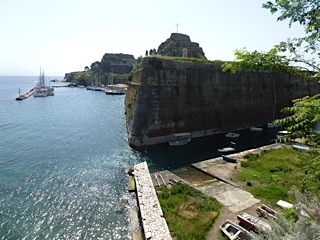 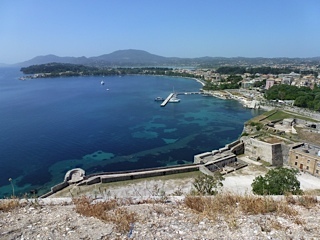 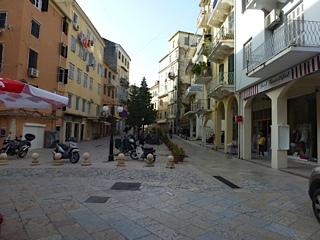 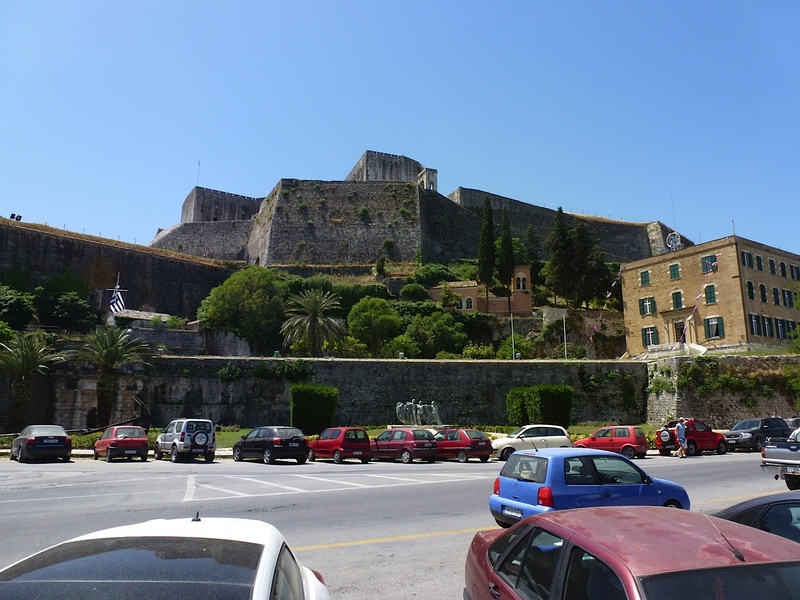 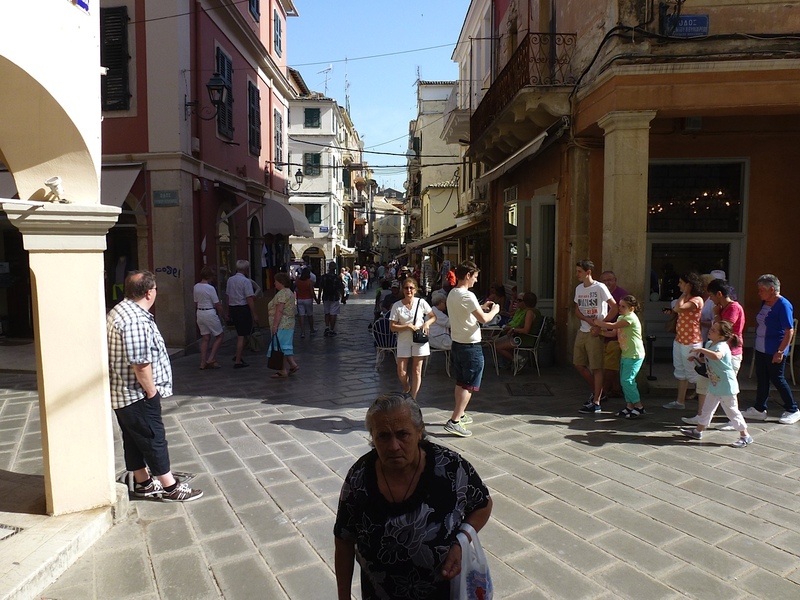 We took a bus (1.5 euros each) to old town Corfu which was less than two miles away and walked a lot exploring town, a fish spa, a park by the Asian Art Museum, and the Old Fortress of Corfu (4 euro each). 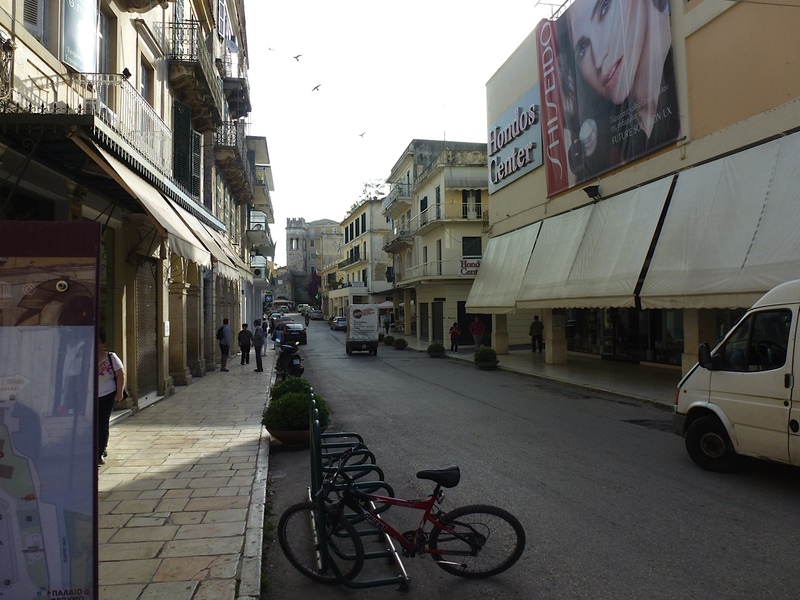 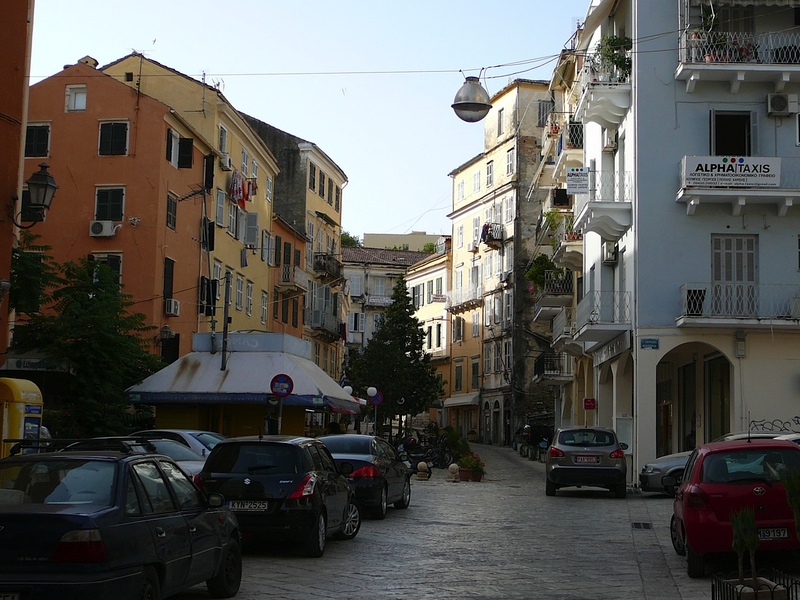 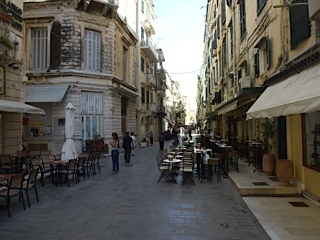 The town had a lot of narrow streets shared with cars and motorcycles. 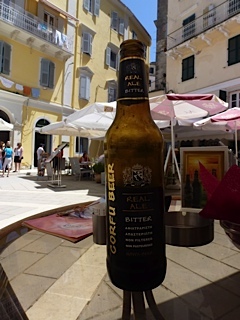 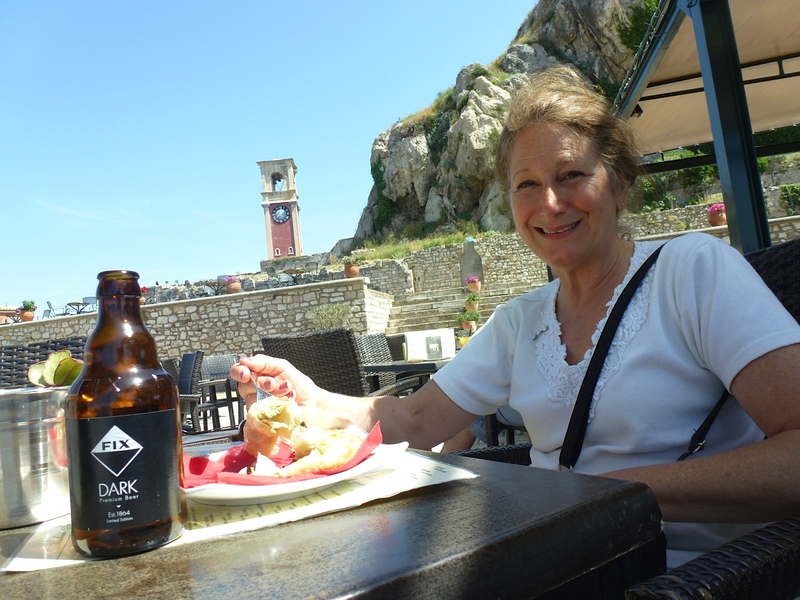 The weather was in the 80s and we stopped for a couple Fix dark beers and spinach pie in the Fort and tried a Corfu Beer - bitter at another location. Both beers were dark, cold and good. I picked up a bag of Kum Quates at the local grocery store to try the local fruit treat and they were also good. We walked back to the port, boarded and enjoyed our bottle of champagne at the aft dinning area that I had won at the welcome back Norwegien gathering. 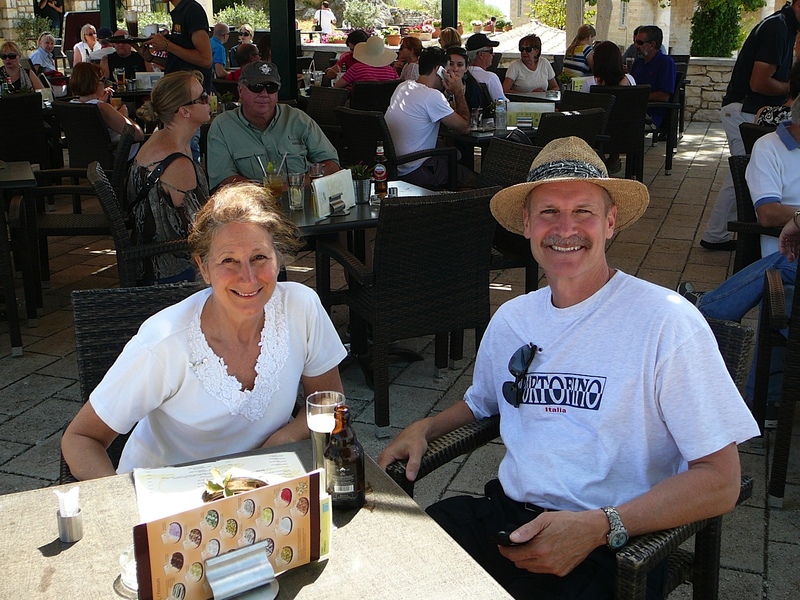 We met a nice couple (Hilga and Tomas) from Cologne Germany and sat together a couple other times in the coming week. Ship' information - One of the lushest of the Greek Isles, Corfu is rimmed in dramatic blue waters and topped with tranquil hillside villages. A collection of quaint cafes in the town of Corfu feels very continental, but the island's secluded coves and sandy beaches could only be found in the Greek Isles. Santorini was another tender port so we got up early, had breakfast and went to picked up our tickets a half hour before distribution time. 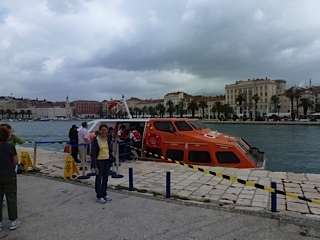 The line for tickets was already long, so we were with tender group 4 which was still within the first 45 minutes after clearance to go to tenders. 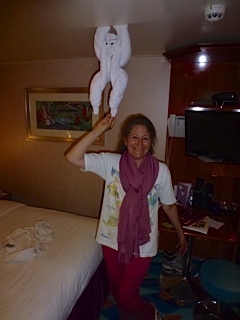 Lynn went to get a spa hair treatment with a scalp, neck, and shoulder massage. 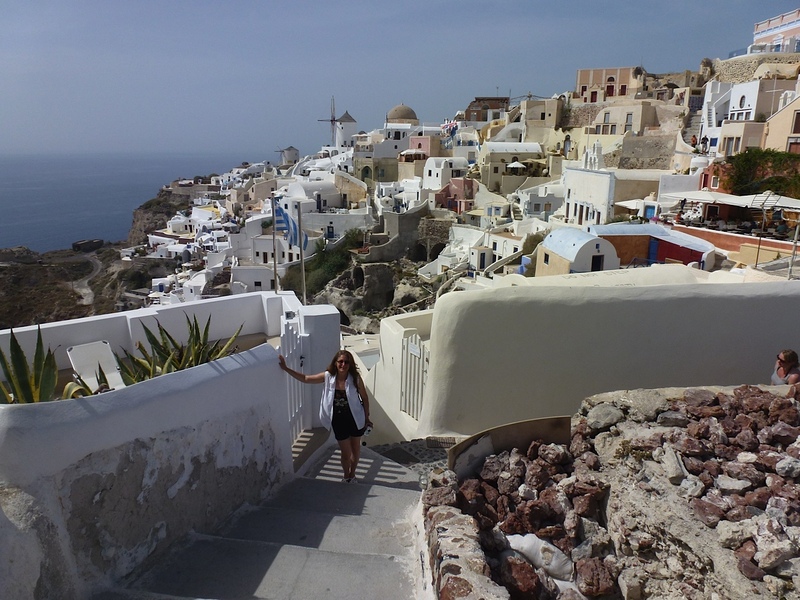 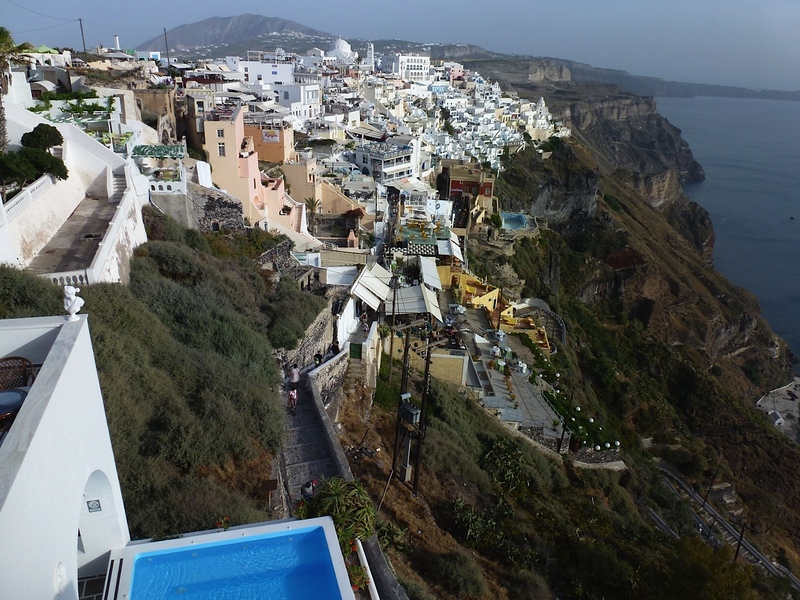 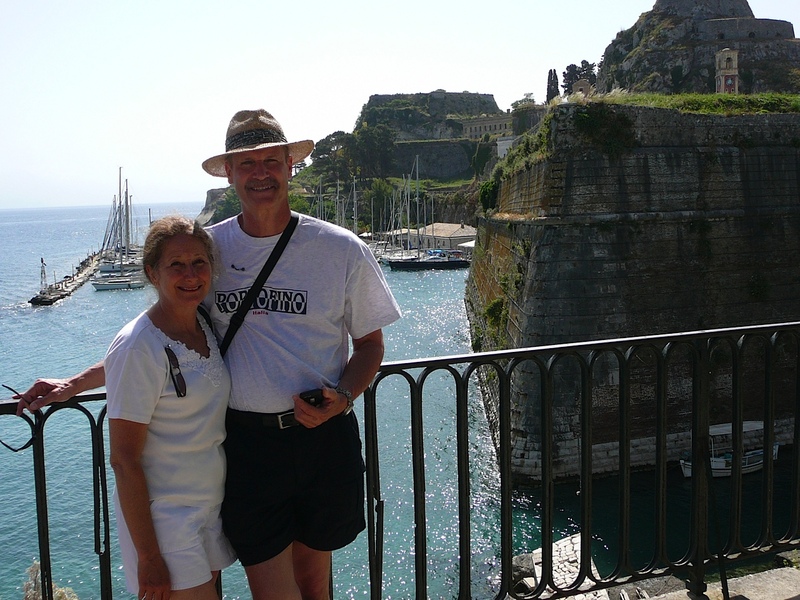 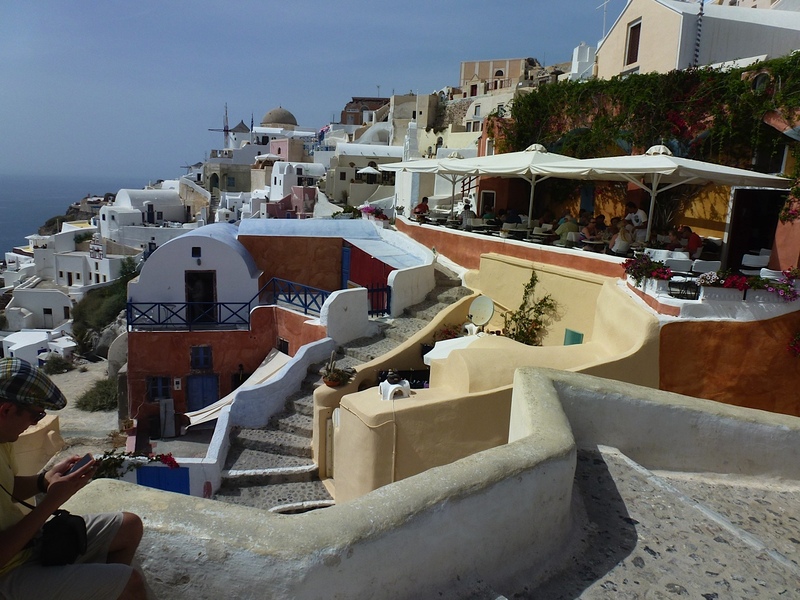 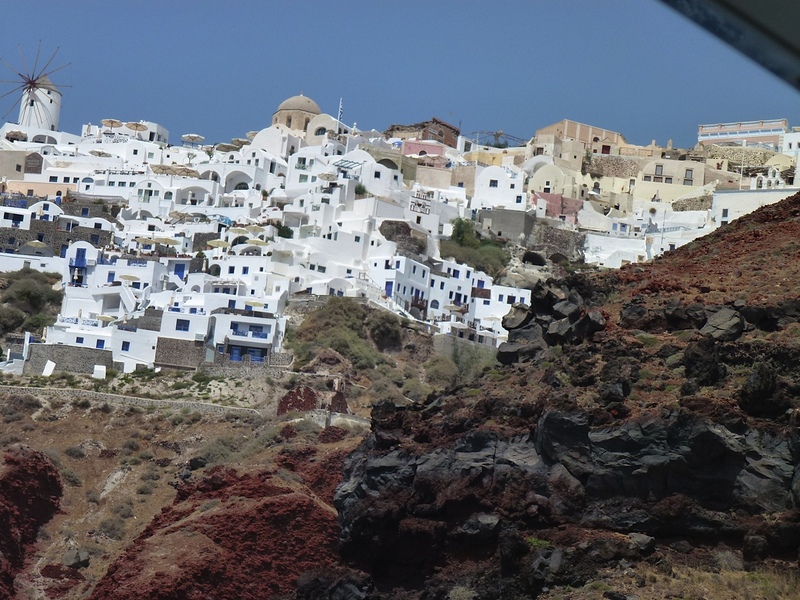 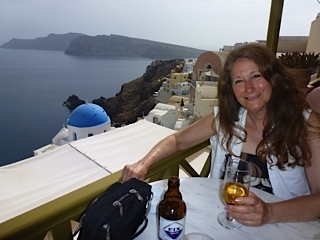 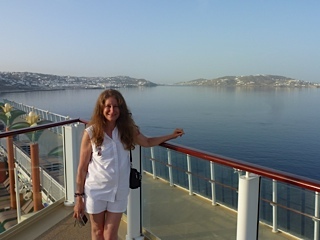 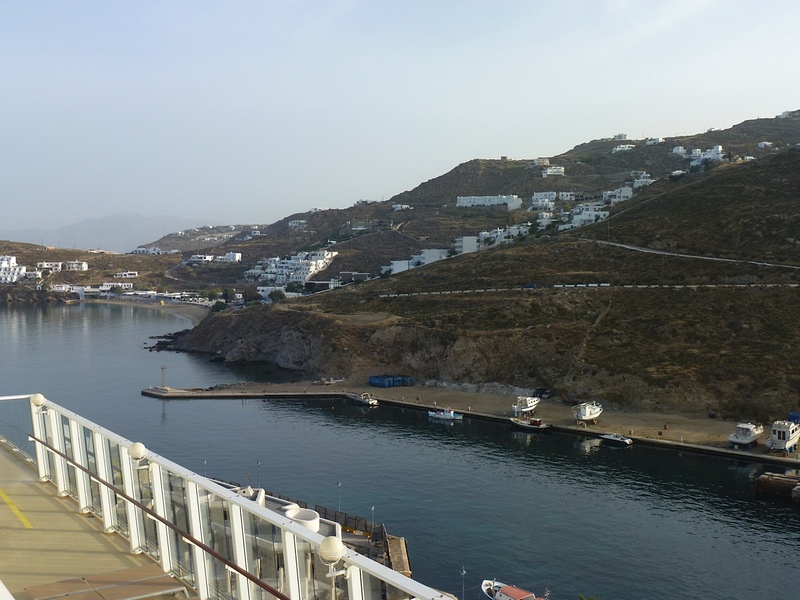 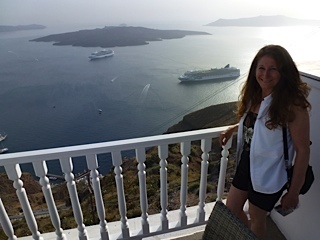 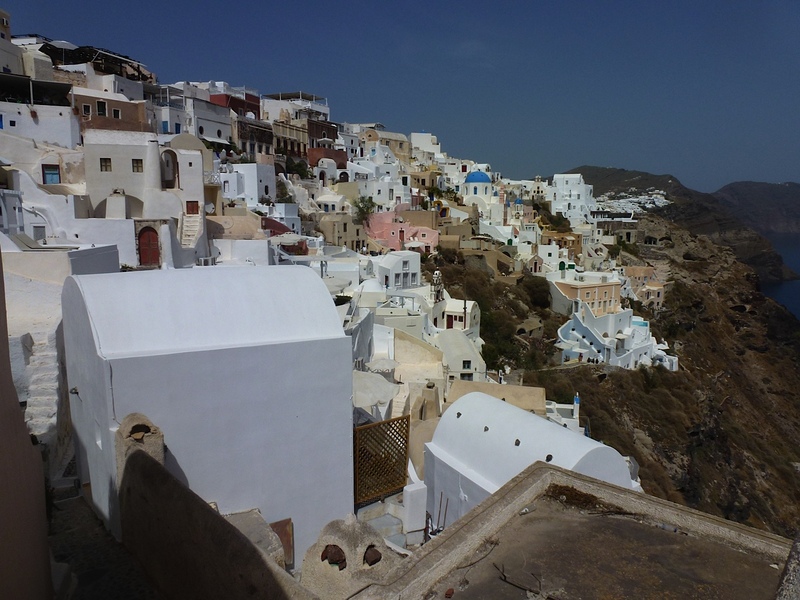 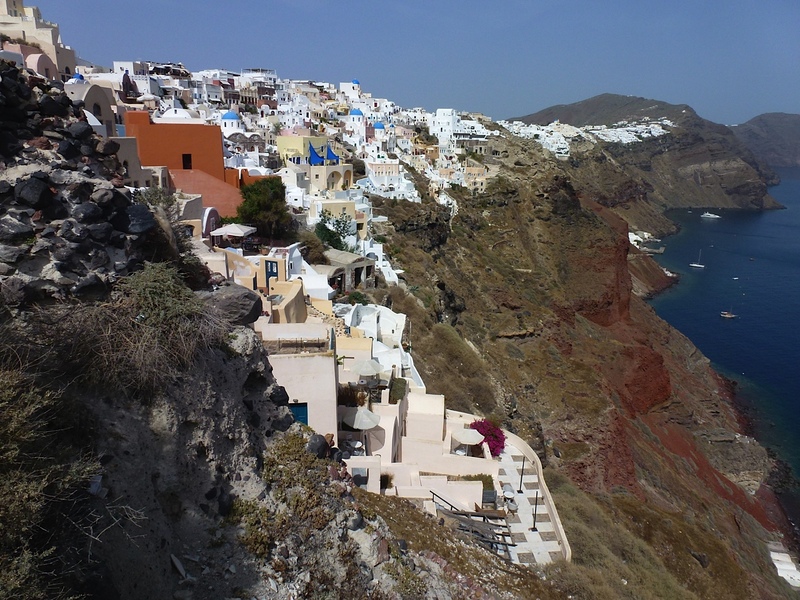 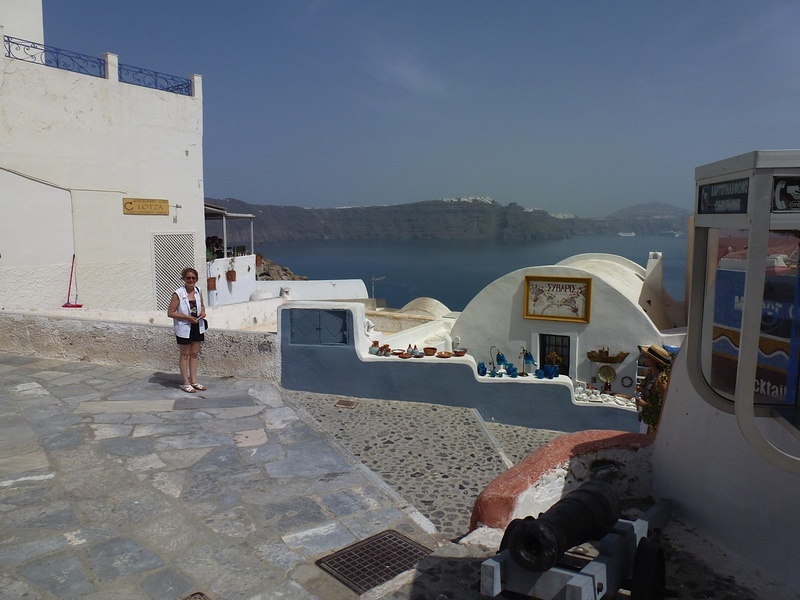 As we got to Santorini, Lynn almost started crying as she was awe struck with its breath taking views of hills, cliffs and towns. 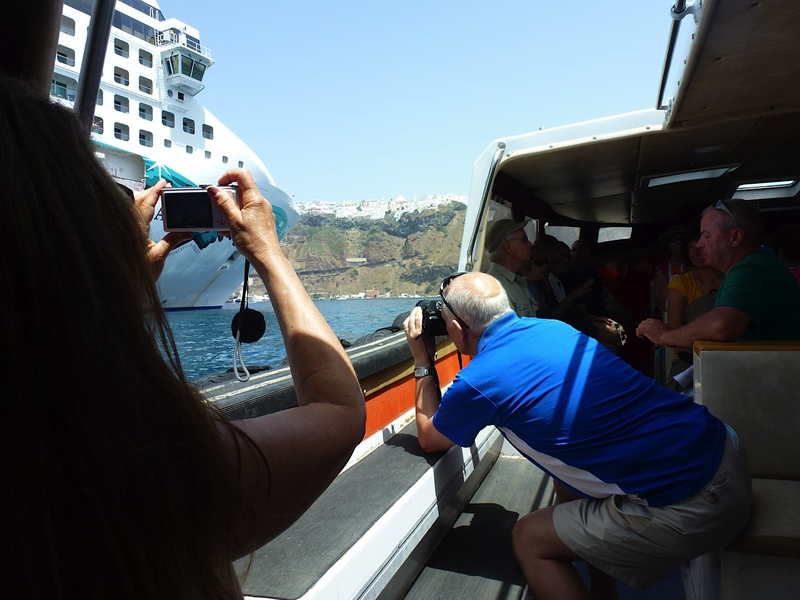 I have to say this was also in my top three stops of this cruise as you had plenty of opportunities to take breathtaking pictures during our tour. 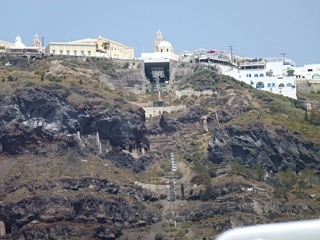 Since we were not one of the first to get off, the cable car to get up the hill to Fira was already busy. The other option is donkey rides up the hill or to walk. 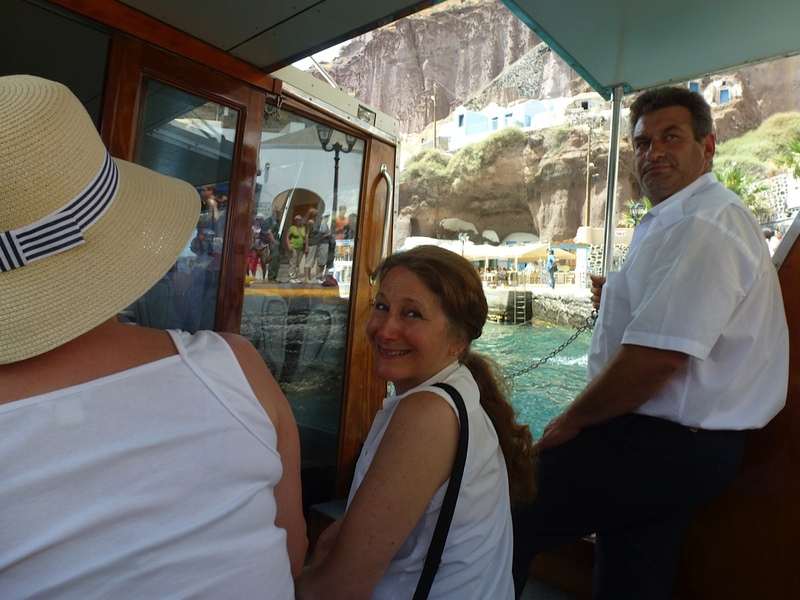 We decided to buy a transportation package (20 euro each) which took us to Oia (Ee-yah) by boat (a 12 minute ride) and then you had to get your van by 5:30 for the last trip back to Fira. 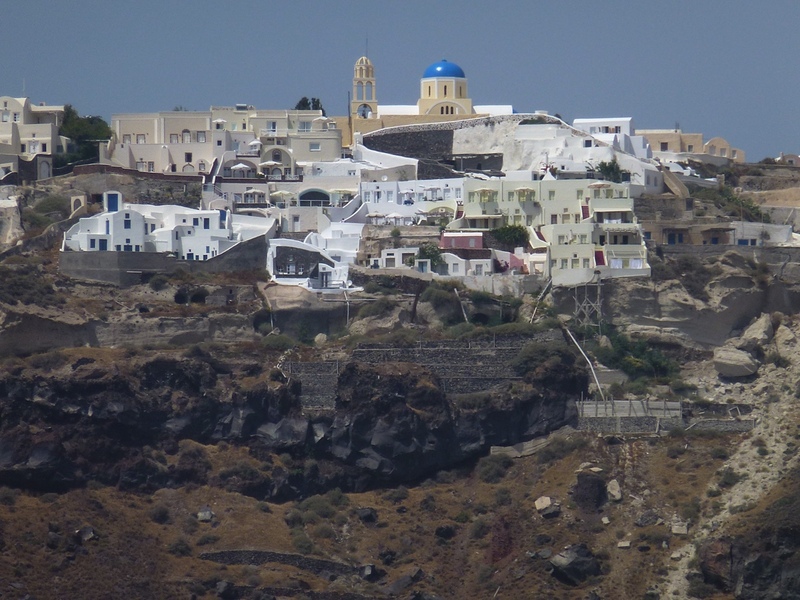 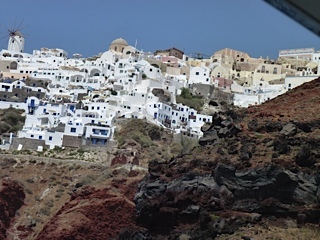 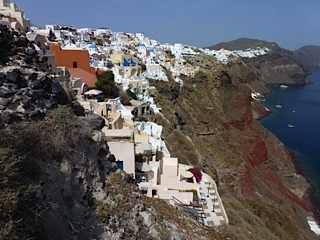 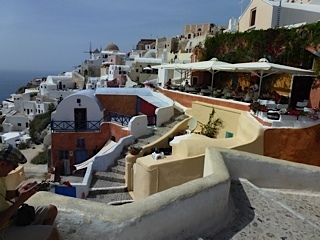 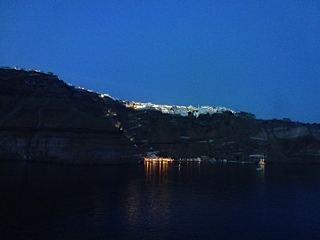 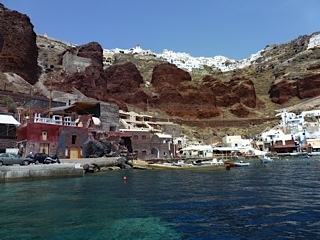 Both towns had great views and we shopped (cards, rings), stopped for beer at one location and a lamb gyro before going back to Fira. 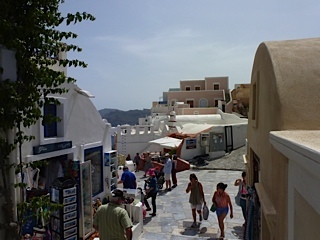 In Fira we stopped for ice cream at Kastro's and I connected to their WiFi and Facebook to download a picture. 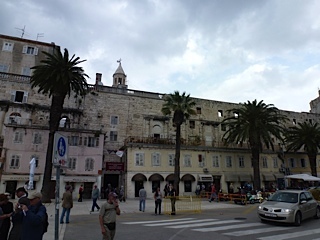 I was occasionally looking for unsecured WiFi networks to log in with my Republic android phone. 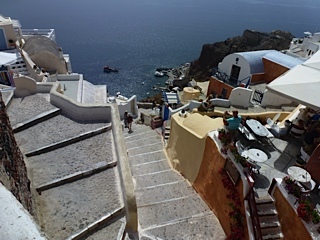 Sprint was unavailable on my phone in Europe. 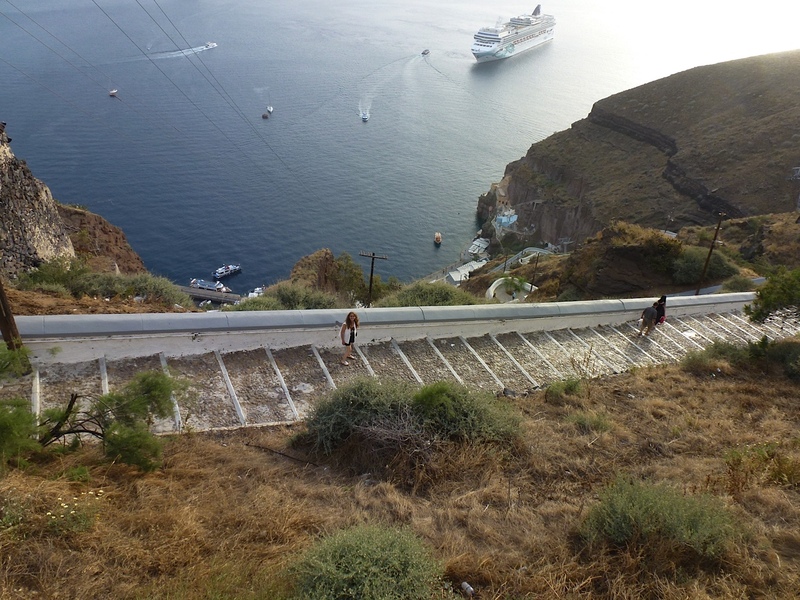 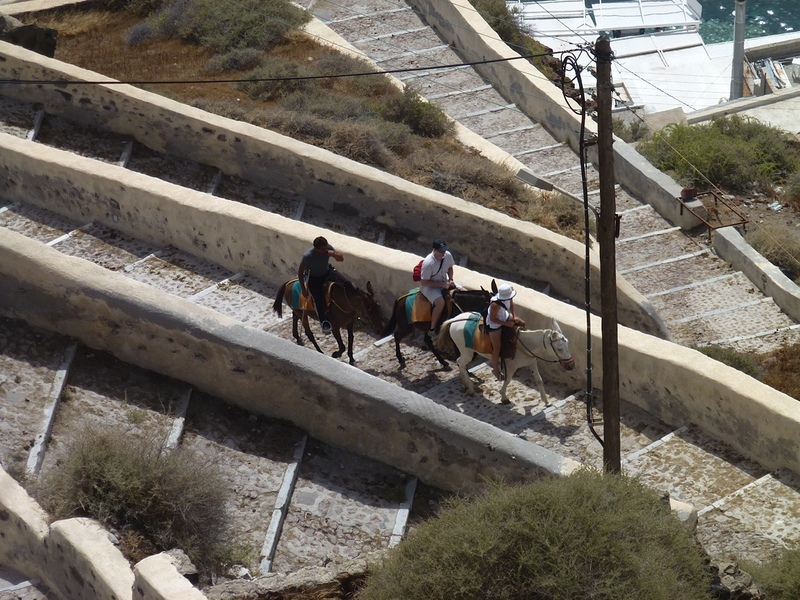 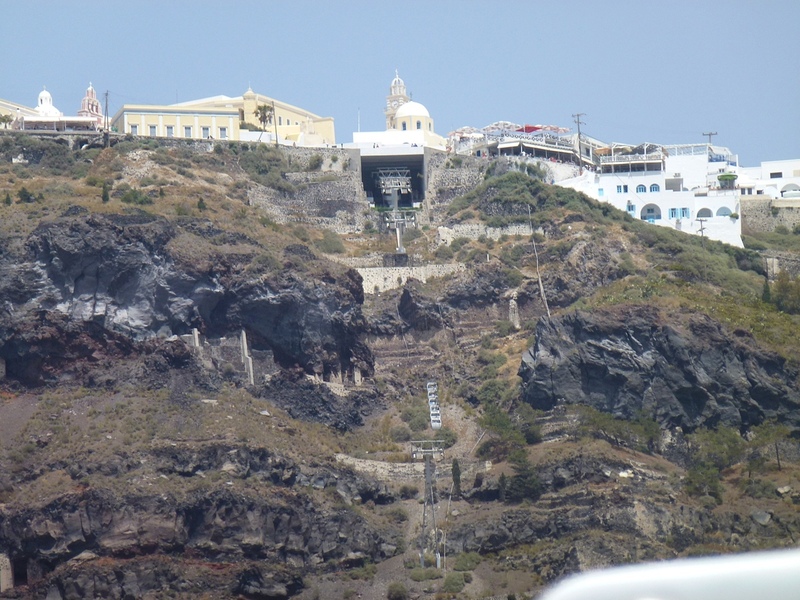 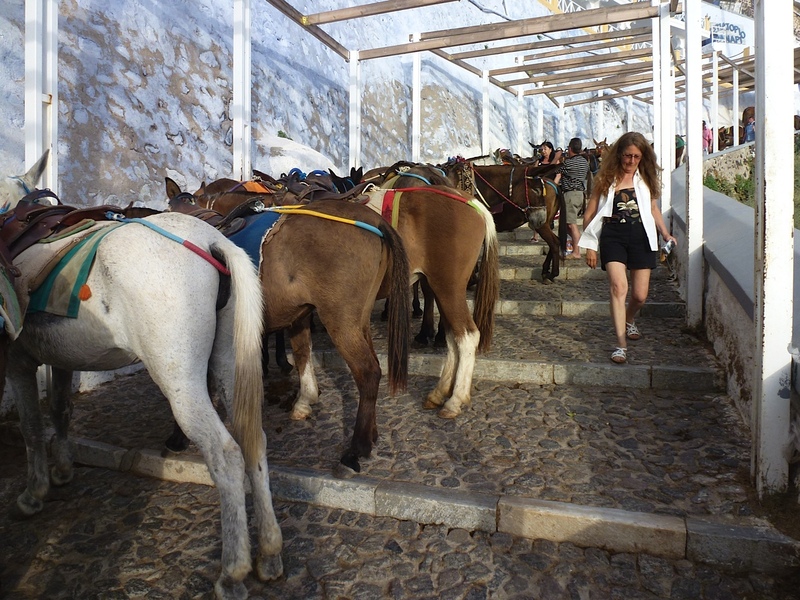 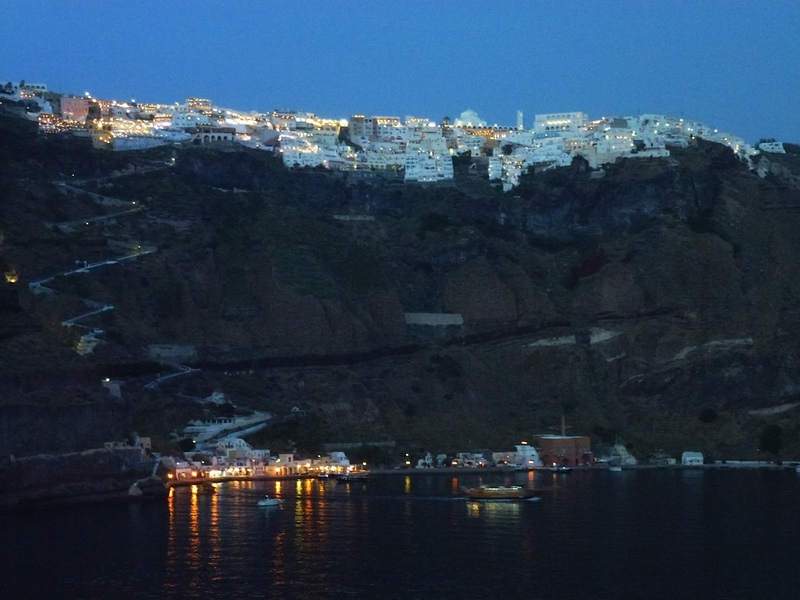 After exploring Fira, you could get lost with all the winding streets, we decided to try the stairs going down to the ship instead of the donkeys or the cable car. 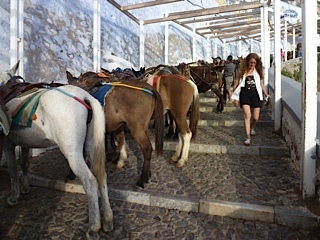 It was easy, but as we learned on the way down, the donkeys leave a lot of droppings and you have to walk through them at the top and watch where you step the whole way down. 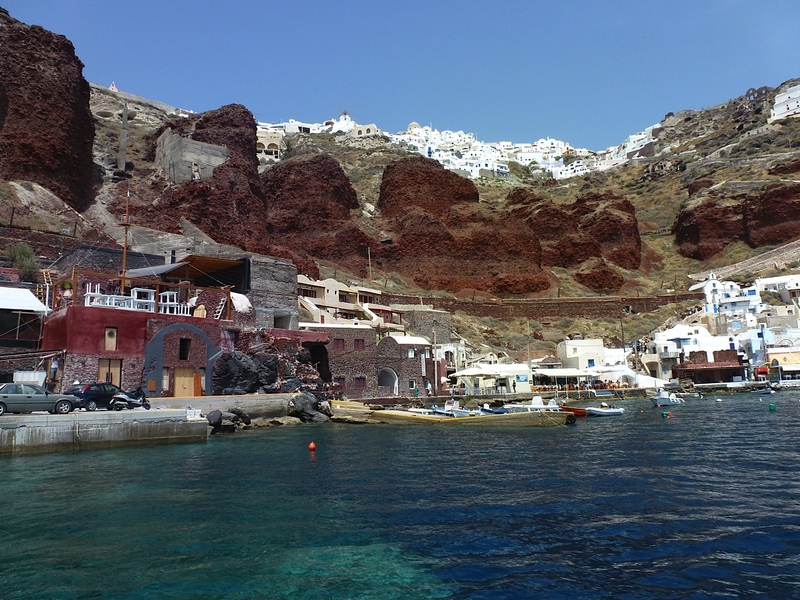 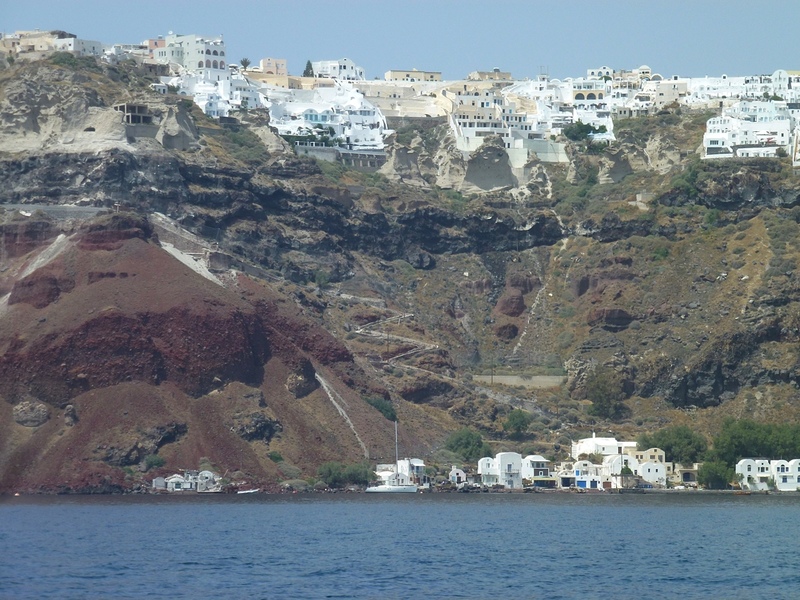 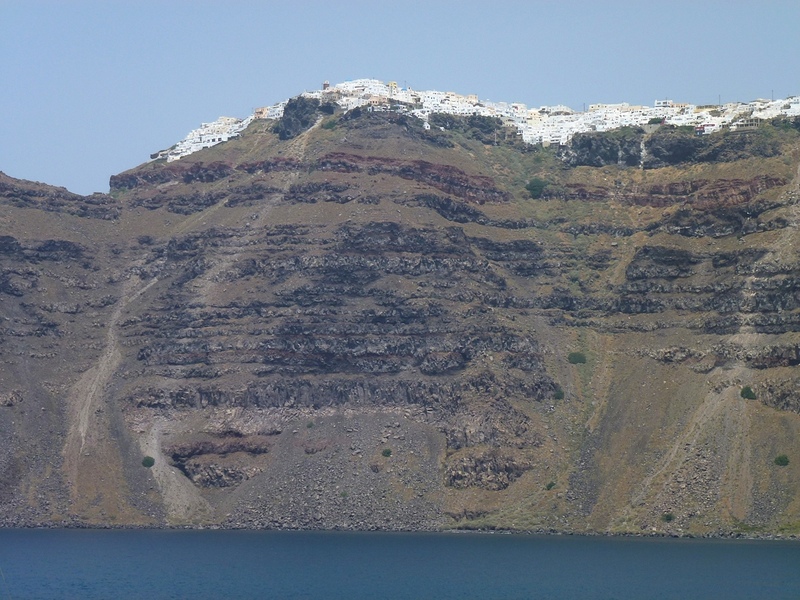 Ship' information - Whitewashed villages clinging to the sides of the sea cliffs have made the volcanic island of Santorini one of the most widely photographed places in the world. 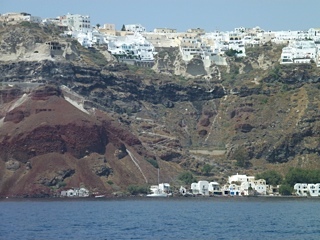 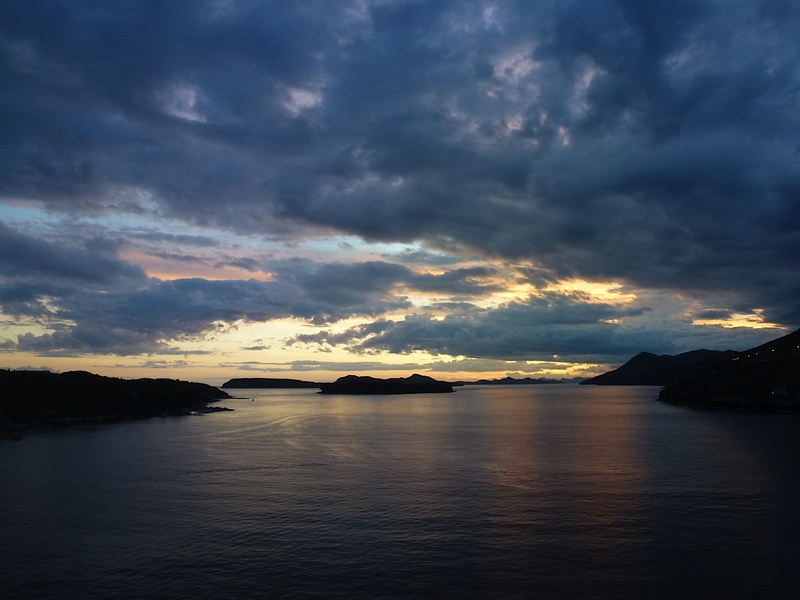 The island's charm and subtle mystery have even made it a target of speculation as the location of the lost city of Atlantis. 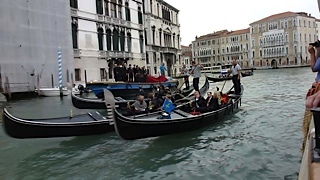 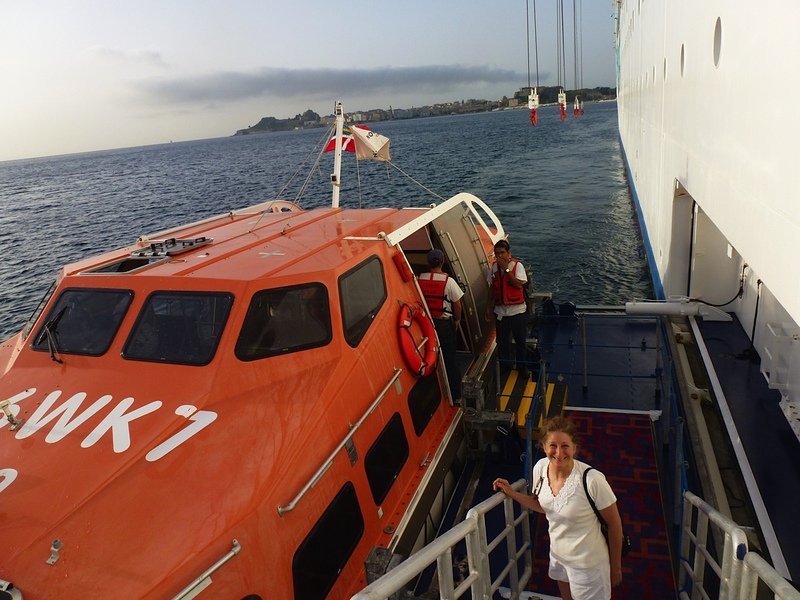 The ship provided a free shuttle to get to town and we got an early start. 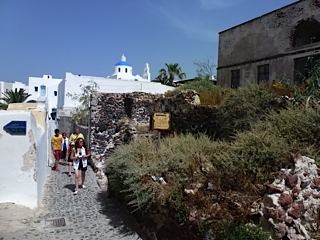 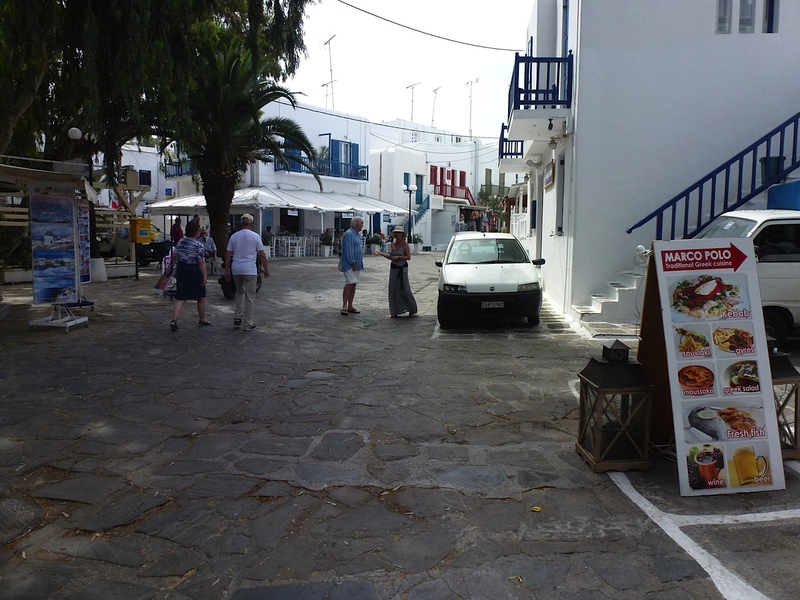 It was a beautiful, charming island with white homes, buildings, and walkways passing shops, restaurants and other clothing and tourist items. 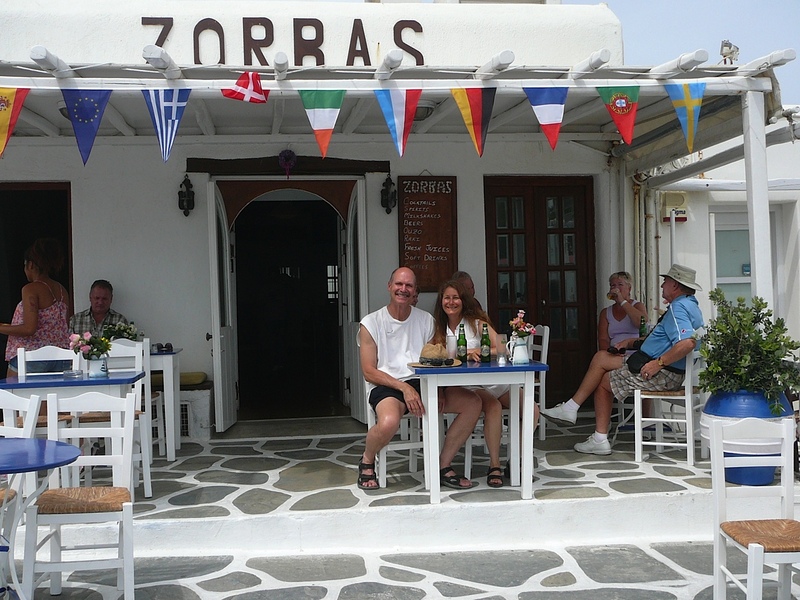 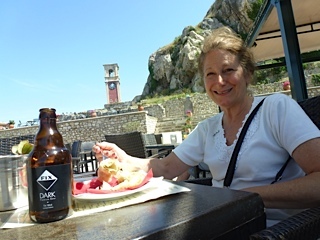 We stopped for a coffee gelato at one shop, and also not far from the windmills to have a couple beers at Zorbas and headed back to the ship for lunch and to rest. After a little nap and lunch we enjoyed some sun by the pool before having our own happy hour with red wine complements of the room steward department. 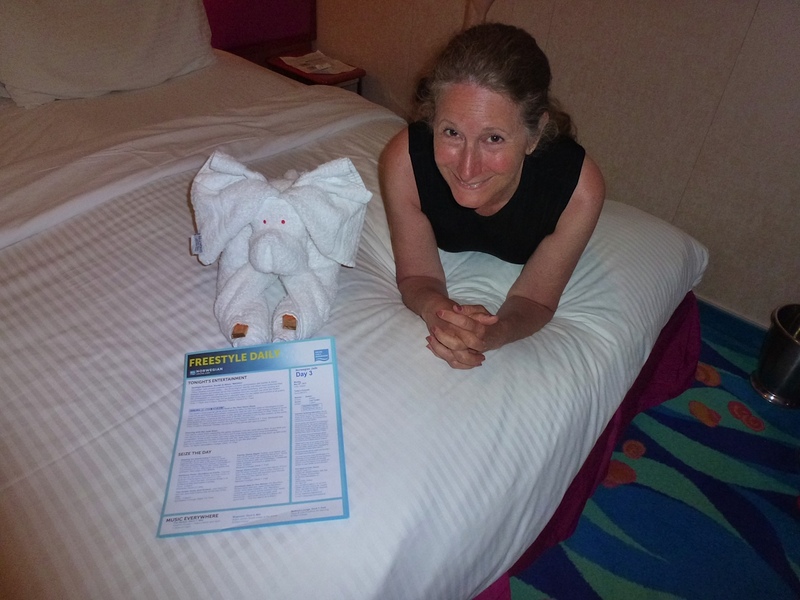 We had a few small issues with our room (ceiling had pop spray not cleaned off when we checked in, small water leak from our facet during the week, a room steward that left mid week and wanted to check the mini bar even though we had do not disturb sign up and came in to pull out one beer which we thought strange, and a worn toilet seat) but the issues were quickly dealt with and they sent us chocolate covered strawberry's and red wine a couple times even though we did not ask for anything other than fixing the issues. 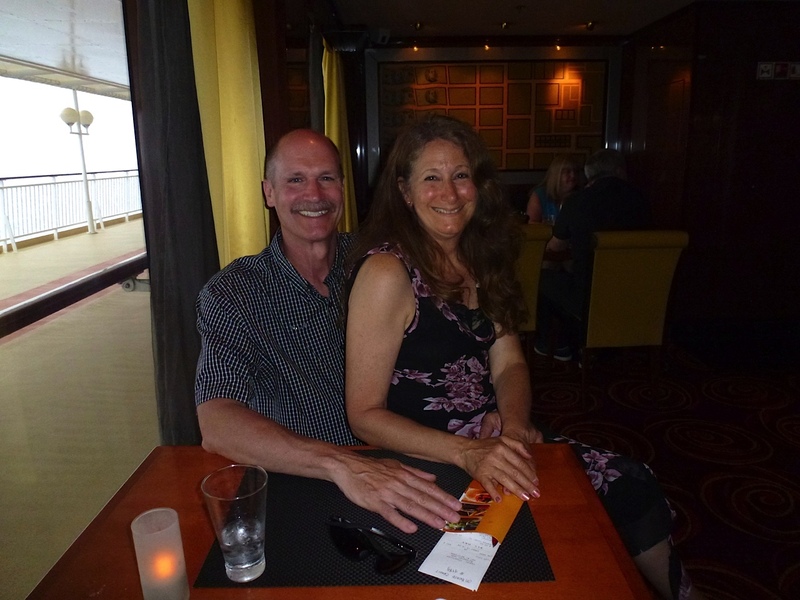 We had reservations at Cagney's steakhouse at 6:30 (25 dollars each) to try out one of the specialty restaurants on-board. 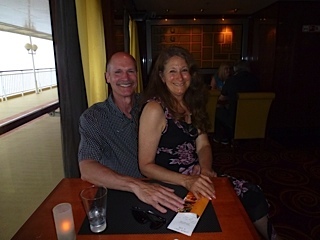 I had a Caesar salad with anchovies, T-bone steak, and a raspberry creme brulee, as part of my seven course meal and Lynn had a Lamb chop dinner. 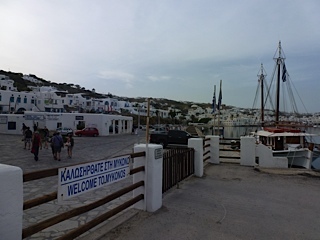 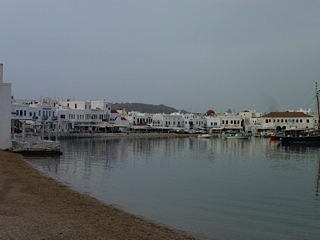 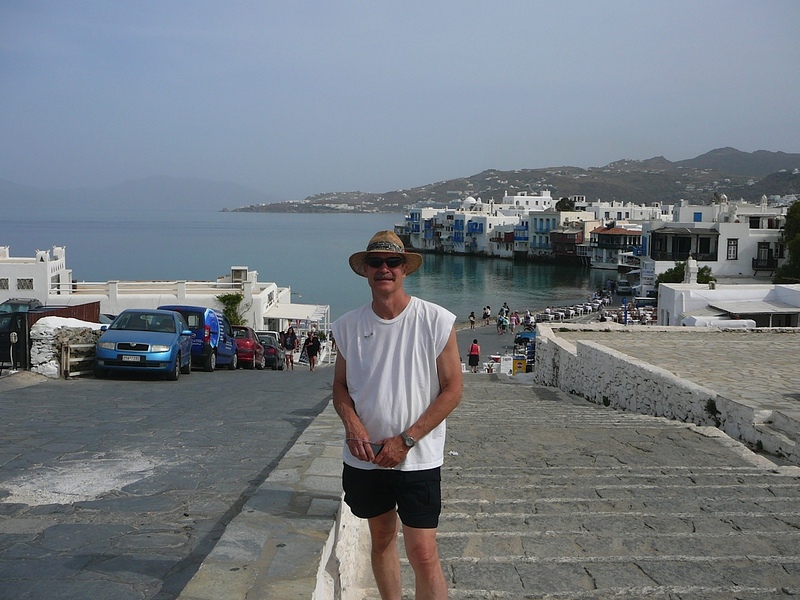 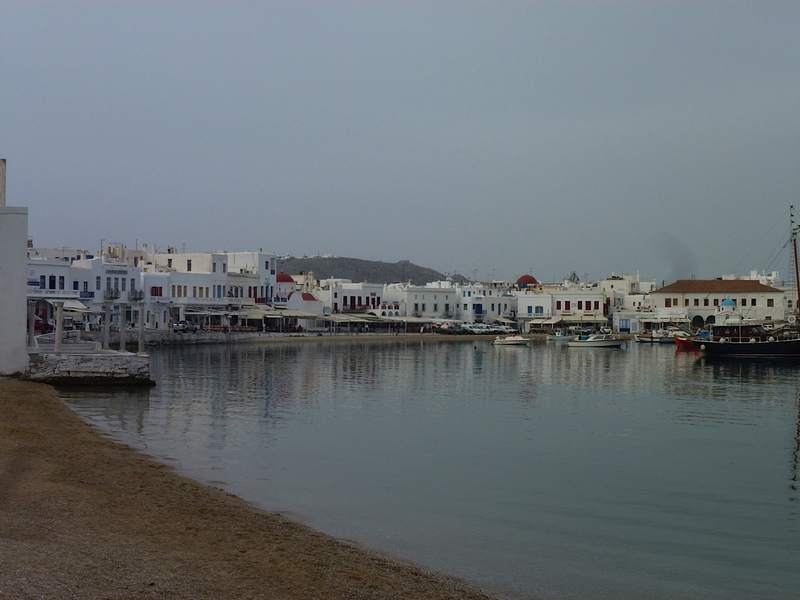 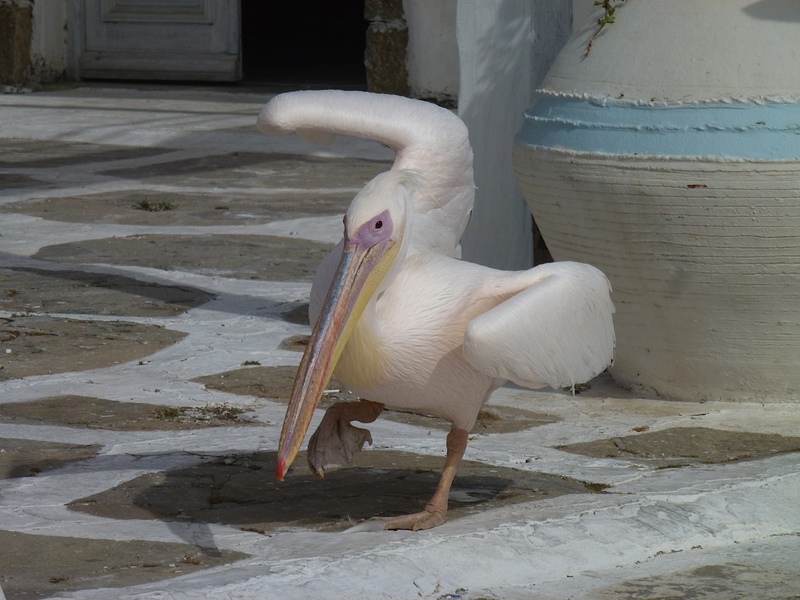 Ship' information - Mykonos is a classic Greek Island with whitewashed houses, blue-domed churches and windmills. 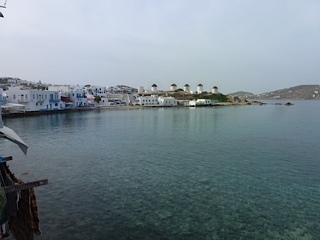 Add a reputation for beautiful beaches and you'll understand why Mykonos is the most popular island in the Cyclades. 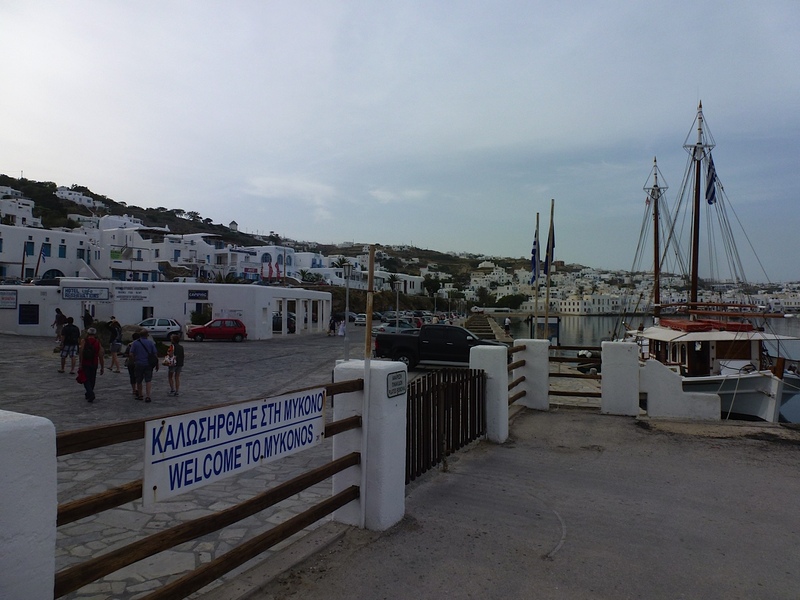 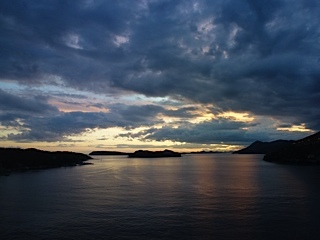 Explore the island in a 4 x 4 or take a ferry to the tiny island of Delos. 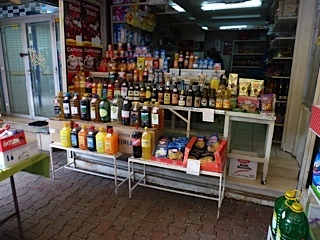 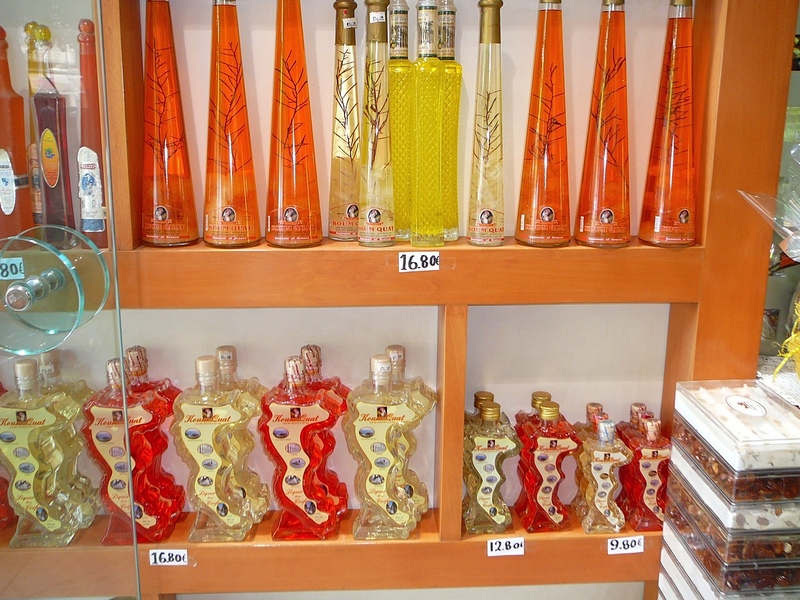 Katakolon was a small town with one main strip of stores. 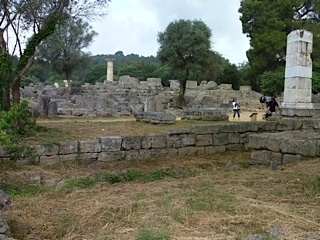 We took a 30 minute bus trip (10 euro each) and spent the morning in Olympia, the ancient city and birthplace of the Olympics. It was overcast and was sprinkling on and off. 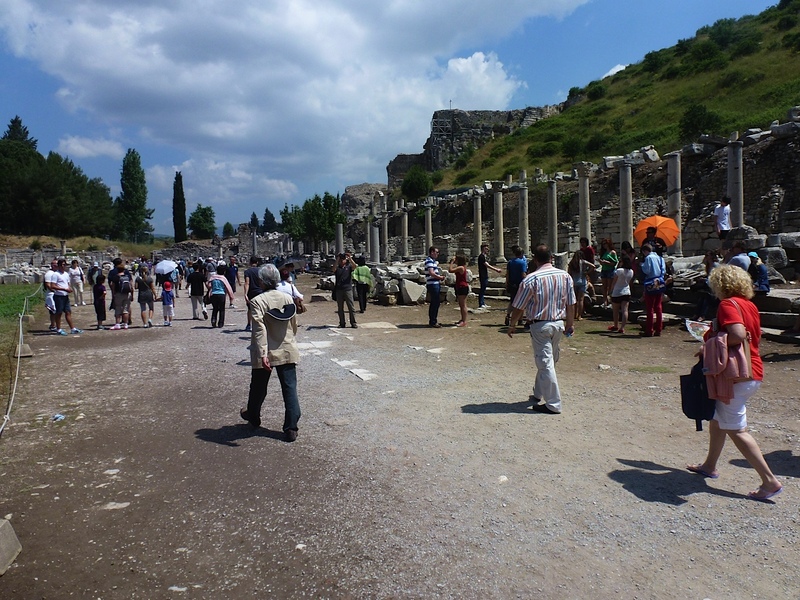 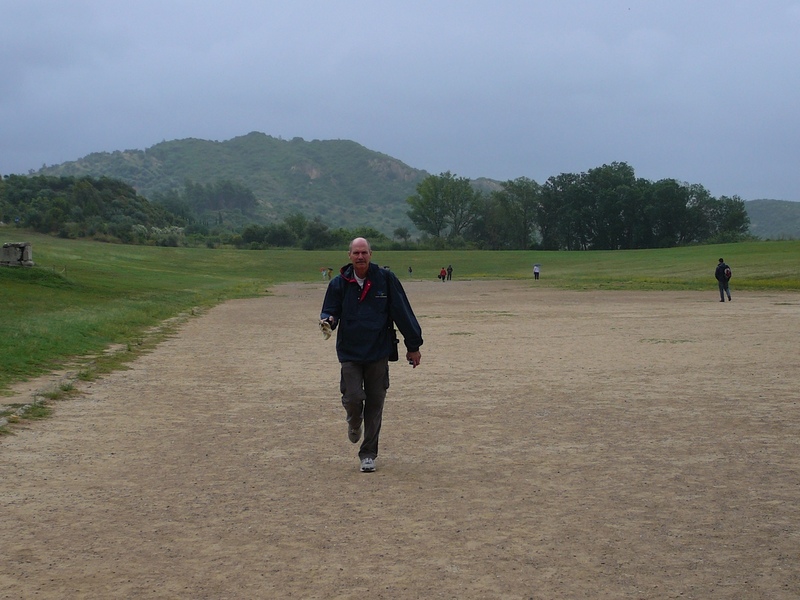 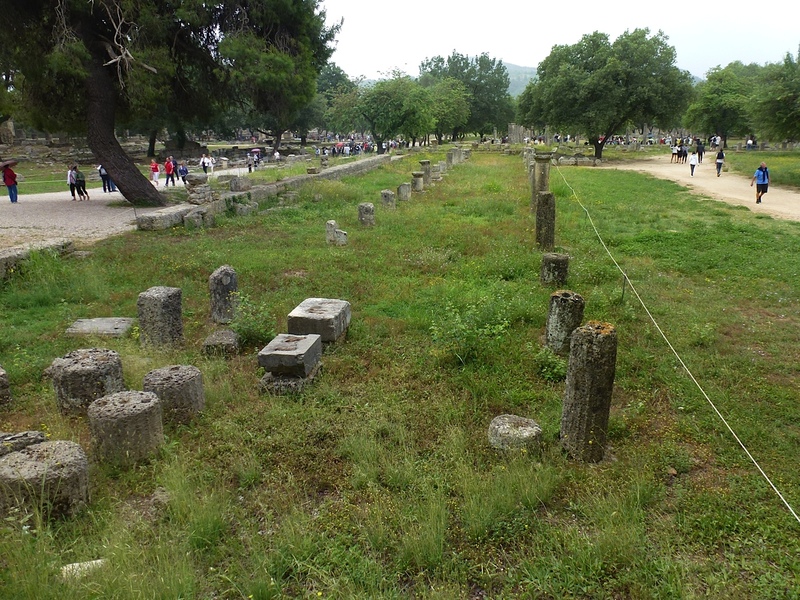 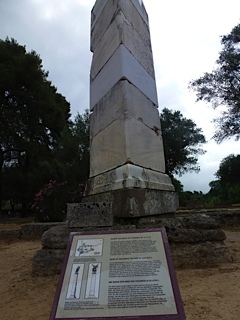 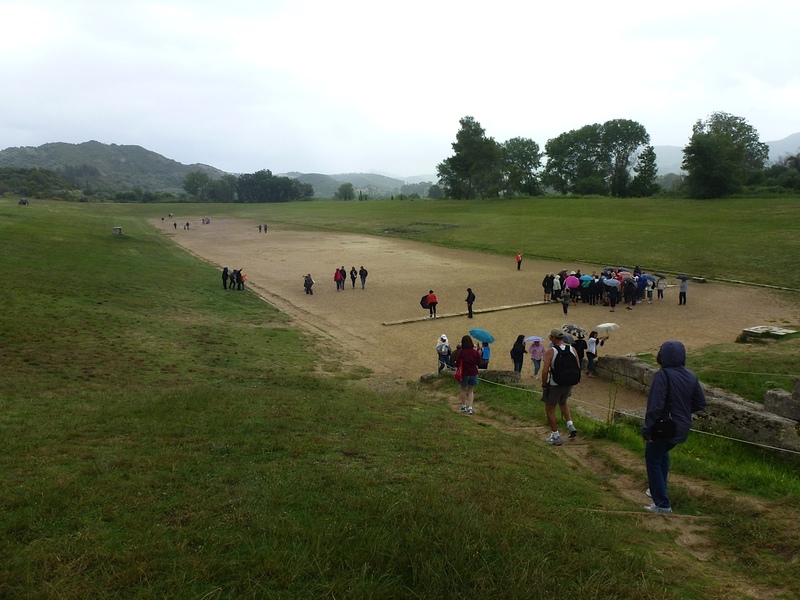 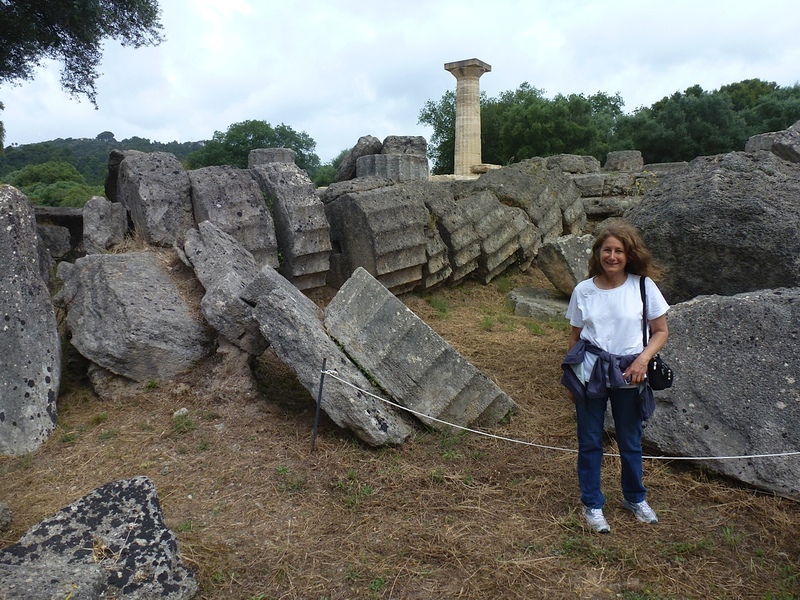 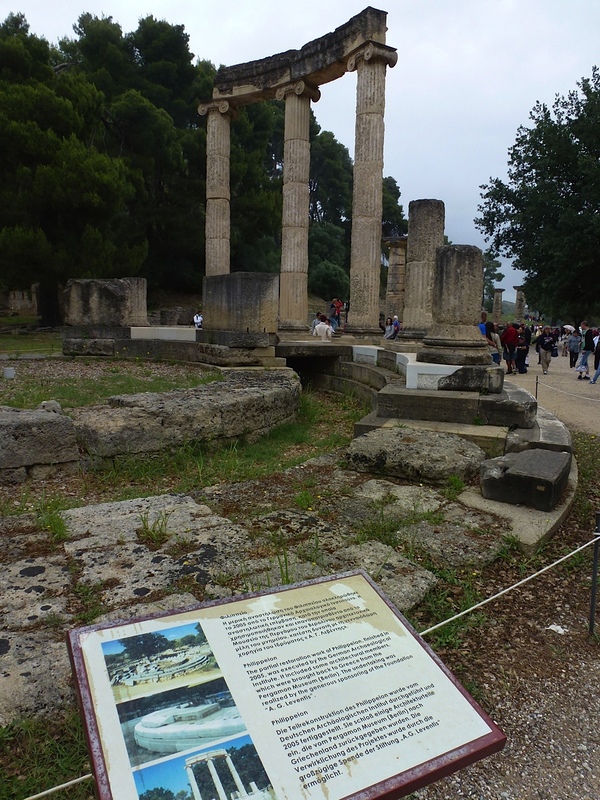 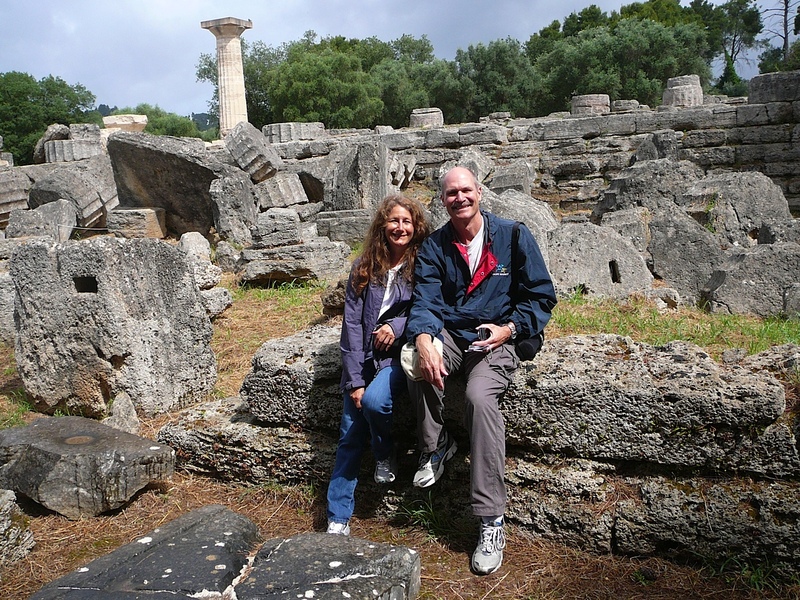 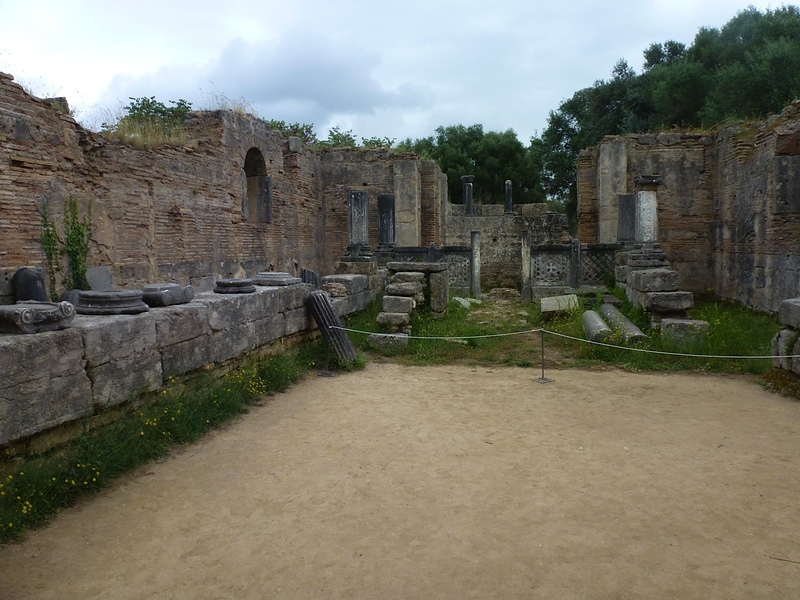 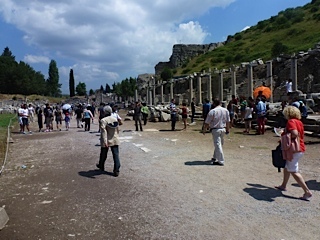 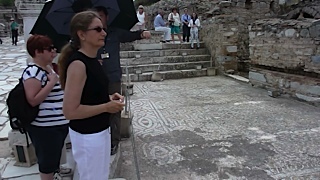 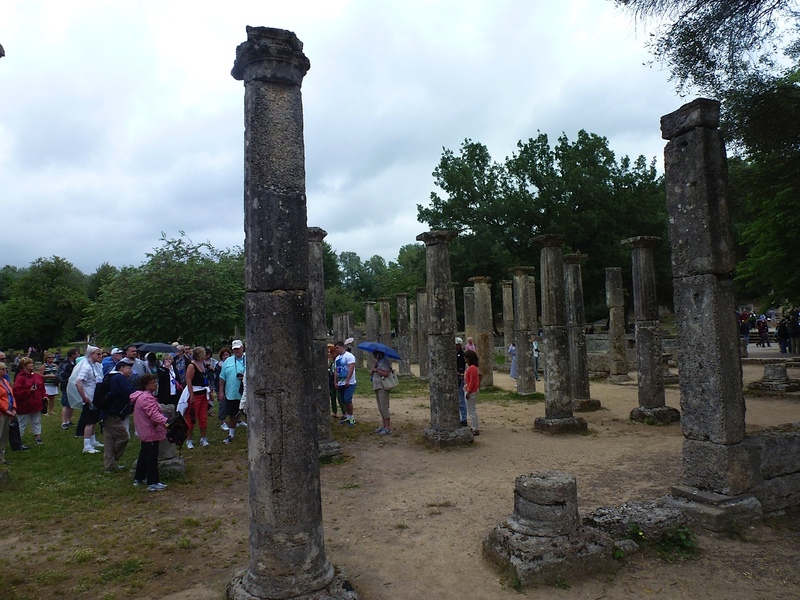 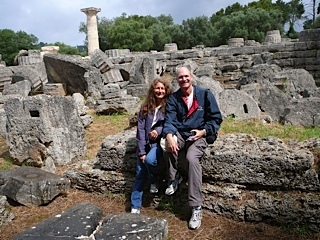 It was 6 euro each to get into ancient Olympia and we only had a couple hours there on the trip we chose which was enough to explore the grounds, seeing sights like the original track, and temple of Zeus, Gymnasium, Baths, etc. 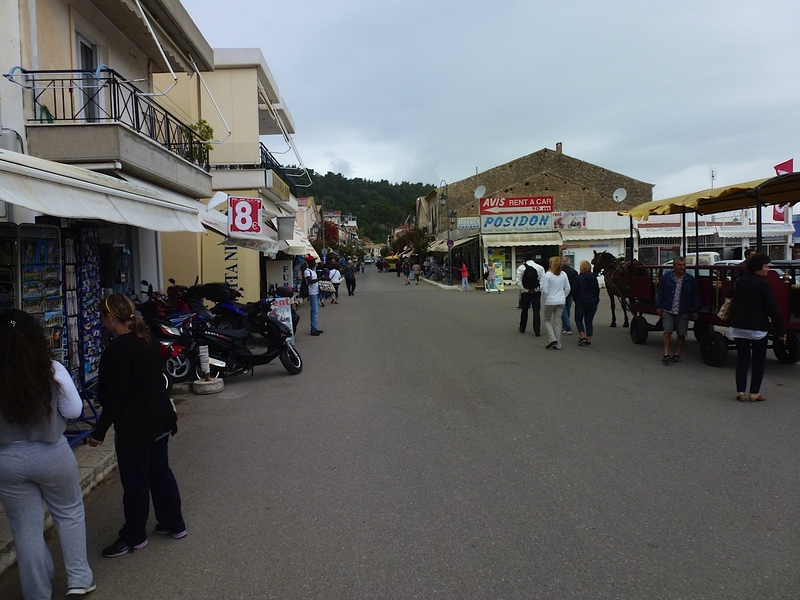 There was also a museum for a additional charge but we only had about half an hour before needing to catch the bus back, so we quickly looked at some of the shops in town before heading back via the bus. The nights cruise was to seas of 7.5 to 12 feet, so a little rougher night for those prone to sea sickness. Lynn kept her sea band on while going to sleep and we woke to smooth sailing in the morning for our last sea day back. 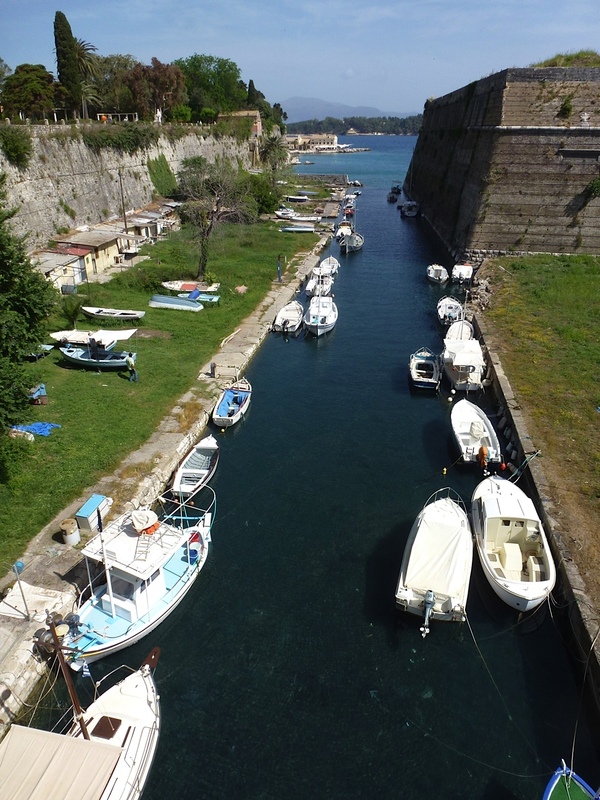 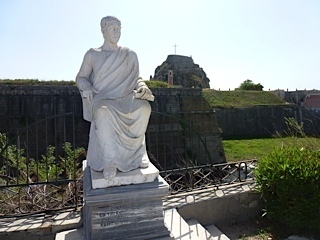 Ship' information - This quaint little seaside town on the Ionian Sea is the gateway to Ancient Olympia, where Greek mythology was born and the first Olympiad was held. 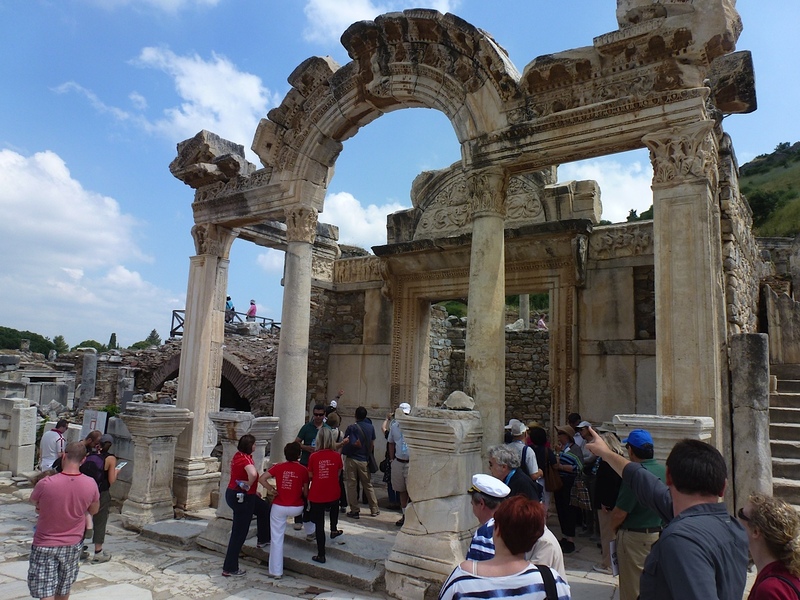 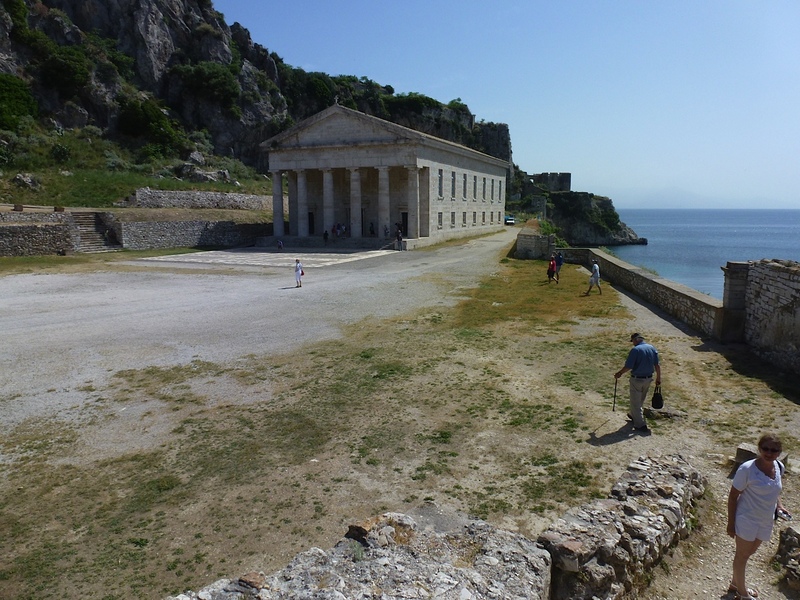 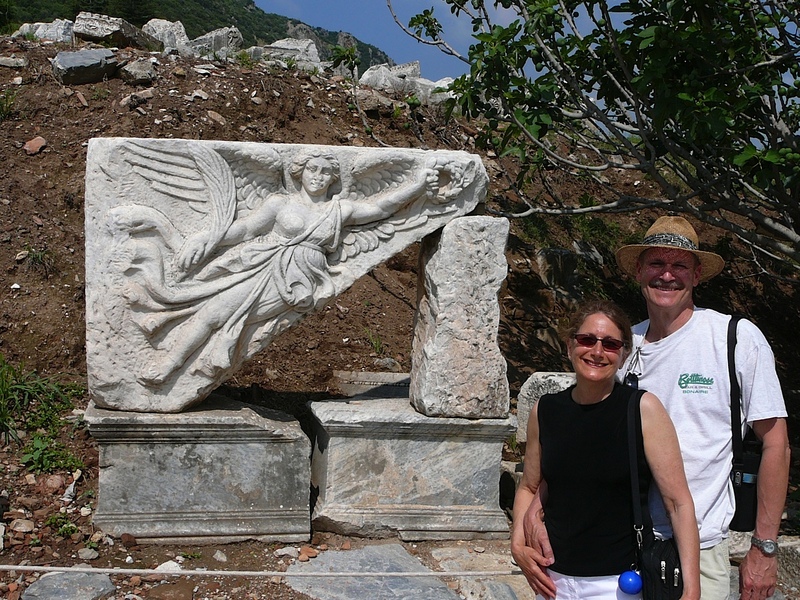 You may still be able to hear the distant echoes of the ancient Greeks cheering as you tour the ruins of one of the most important and exciting sanctuaries of antiquity. 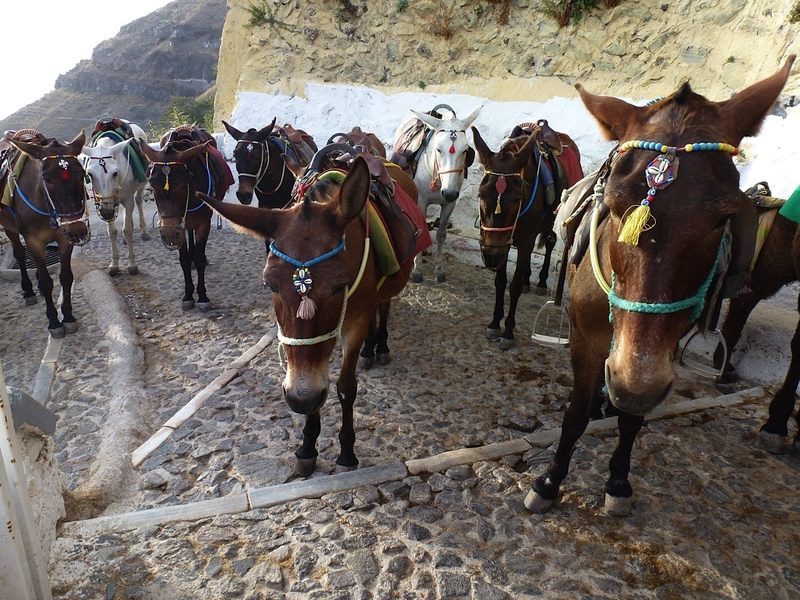 Once back we had personal transportation take us to the airport. 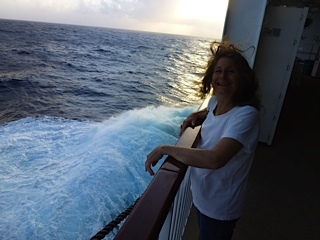 The flight back to New York JFK went well, until the landing which had high winds and turned Lynn green even with her sea band on and set to 2. Once down we were late 20 minutes which turned to 30 minutes when no gate was available on landing. 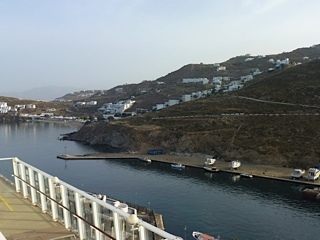 After exiting the plane we had one hour to get through customs, pick up our bags, get through customs again, and get to the next terminal and gate. 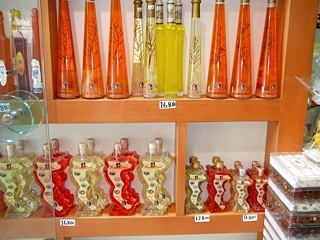 Nothing went quick at that point, as no one and no signs quickly lead us to the expedited customs lane until we heard verbally 15 minutes after standing in line, then another 15 to get through customs, then another 15 to wait for our bags to show up, another 5 to get through customs and try and recheck our bags. At that point the plane was leaving in 10 minutes from another terminal that they said would take us 20 minutes to get to, so they said we could not leave on this last flight to Detroit this night. Then it took 45 minutes until someone at the desk would even talk to us to tell us our options and what they would do to help us with accommodations and re-booking. 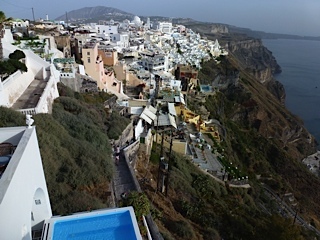 They gave us a room voucher for a room in Long Island about a 20 minute drive away, and gave us a taxi there. 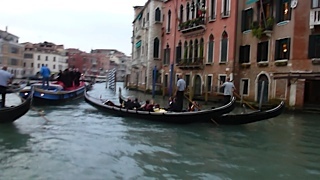 We made them reserve us seats on the 8:00 am flight the next morning and they also gave us a voucher for the taxi back. 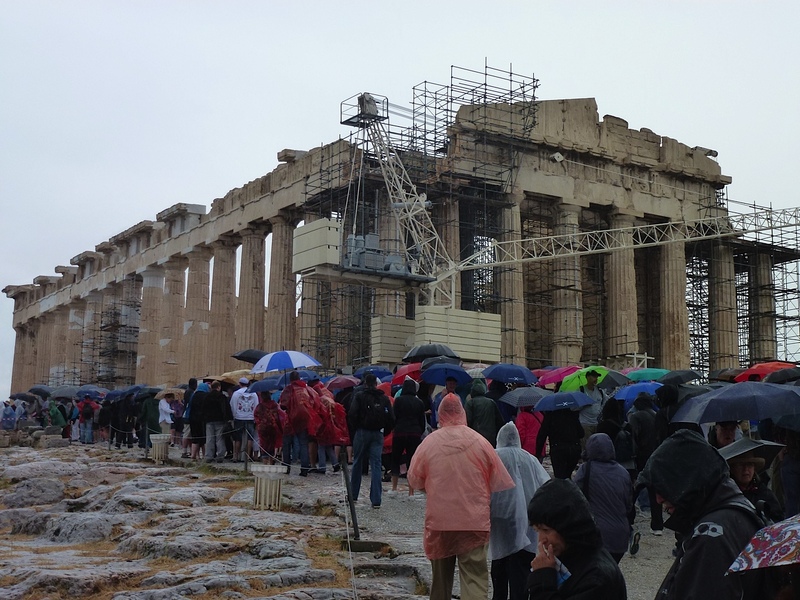 Part of the issue was a new terminal opening up at JFK, the Memorial holiday weekend, and bad weather the previous day that had caused delays and cancellations. 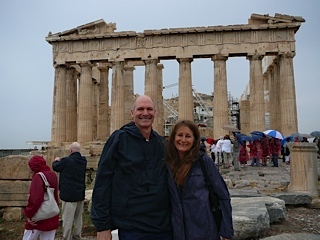 We did get out on the 8 am flight with no other issues on our journey home Sunday. 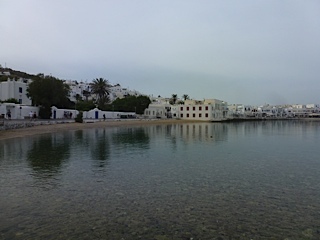 Luckily Monday was the holiday, so one day to unpack and one day to catch up on personal emails and these notes before back to work Tuesday.